Spring is officially here. 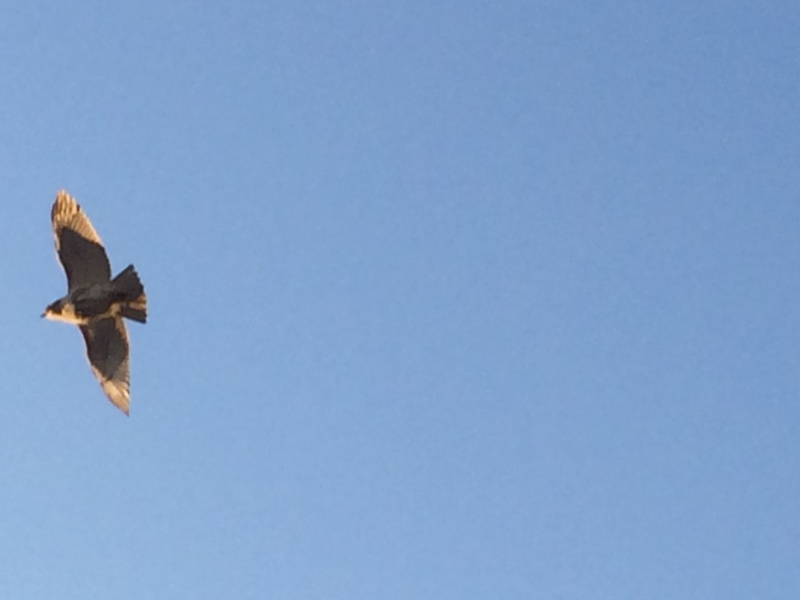 Red-tails are nesting, peacocks are showing, and male mallards are acting downright crazy. 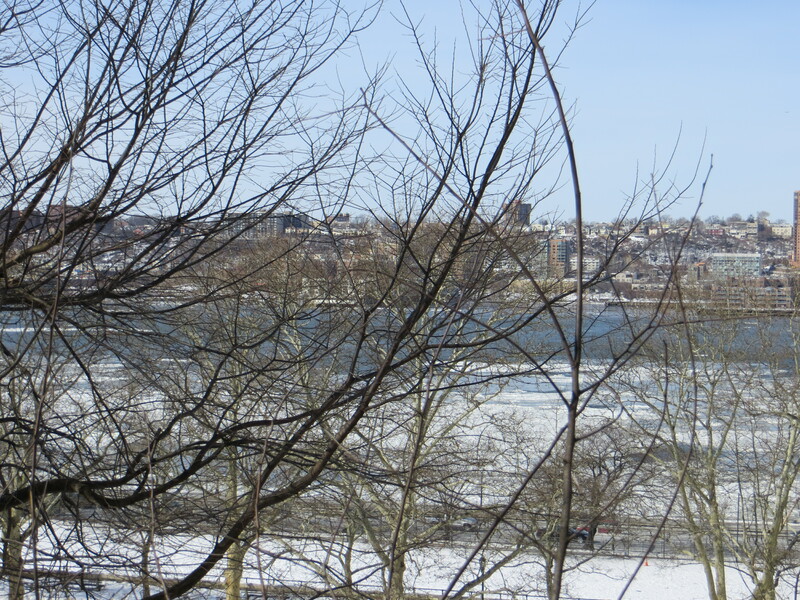 Trees are still mostly bare, which means you can more easily spot wildlife. And feral life. 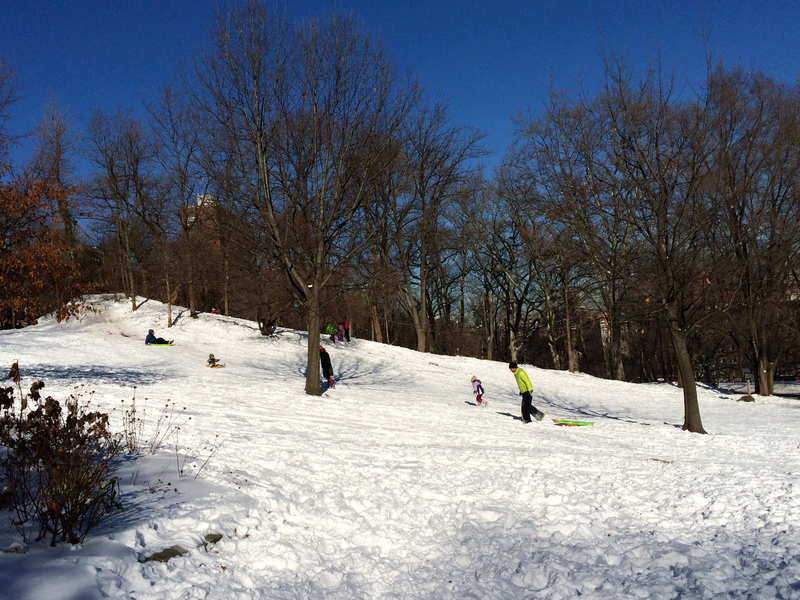 The feral cat colony in Morningside Park seems out of control this spring. 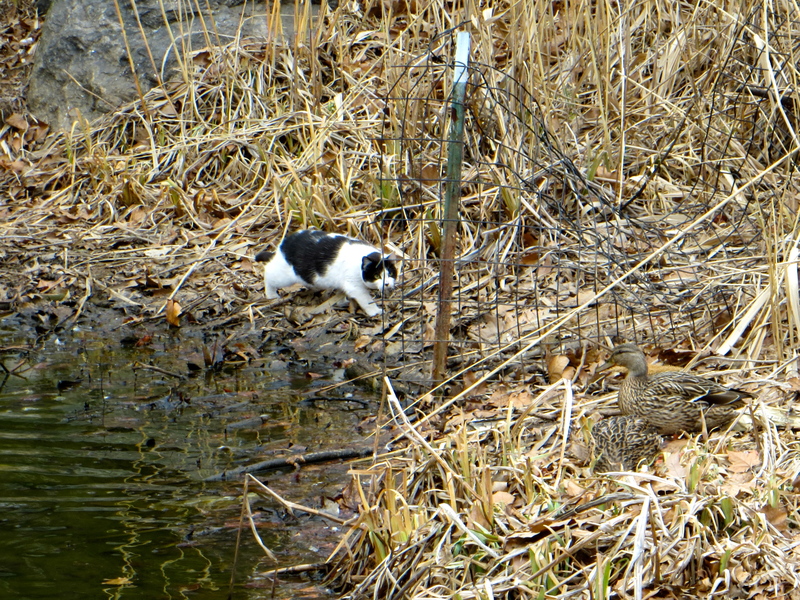 The cats are everywhere around the pond, stalking ducks and other birds. 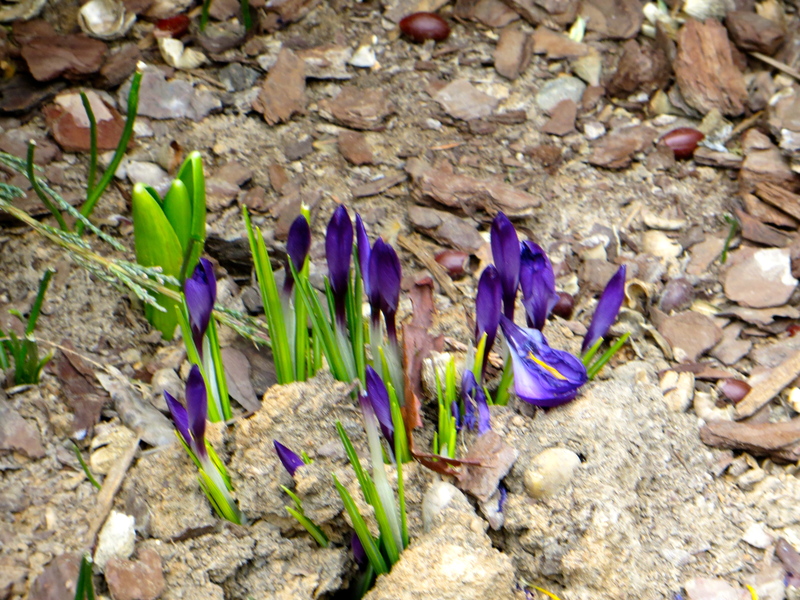 For now, let’s put away the ice rescue ladder, and celebrate the arrival of another spring. 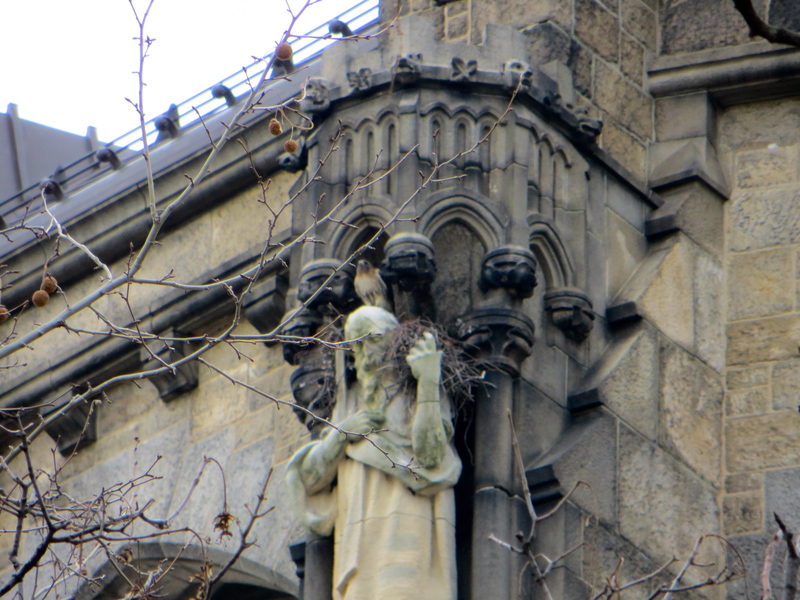 I’m not sure what to make of the collection of twigs amassed by the Cathedral Red-tailed hawks atop Saint Peter’s canopy. 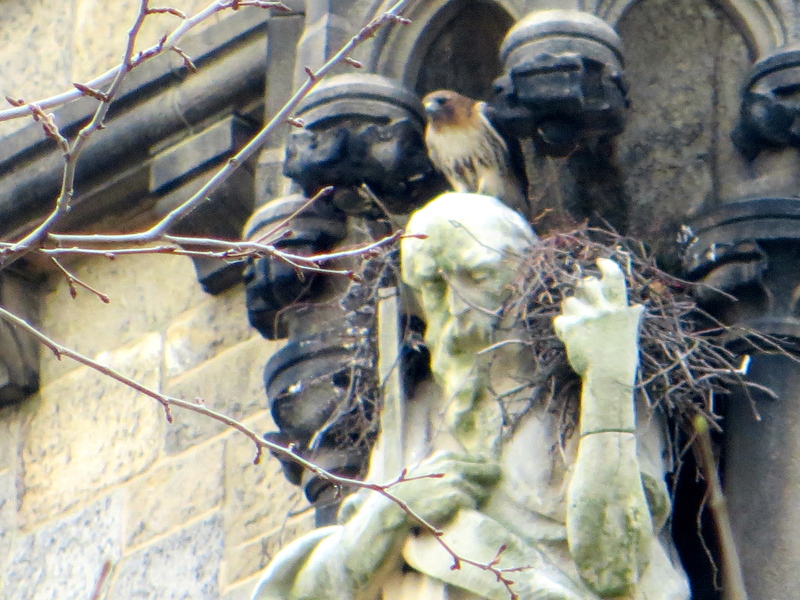 For now, at least, the hawks seem to be focused on refurbishing the old nest on Saint Andrew’s mossy shoulders. When I arrived at the nest this morning, it appeared empty. 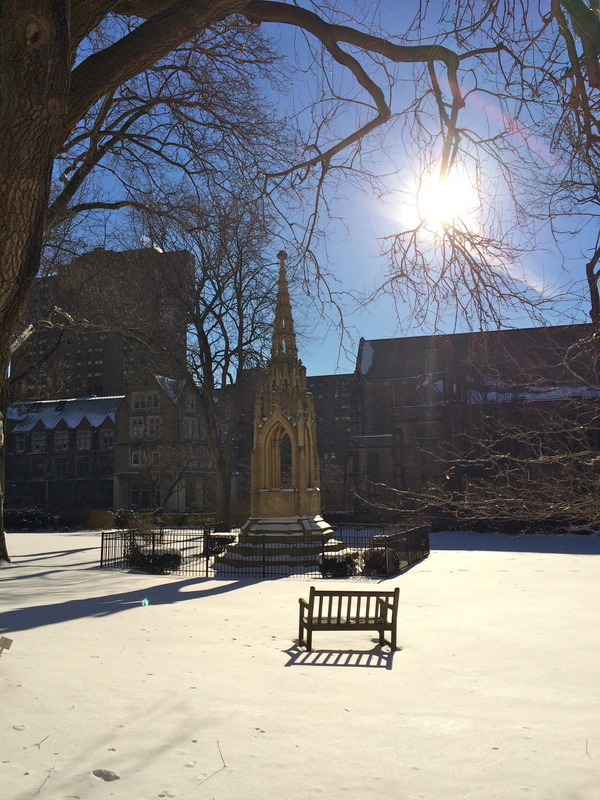 But as I crossed Morningside Drive to enter the park, I looked back toward the Cathedral in time to see a hawk swooping in from the north to disappear from view behind the saint’s head. 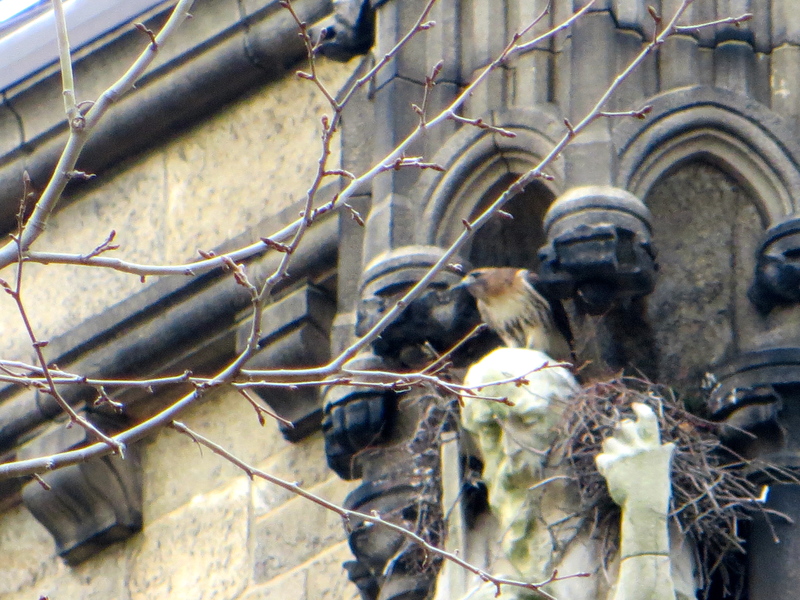 Although I could no longer see the bird, I could see twigs moving as the hawk rearranged nesting materials. 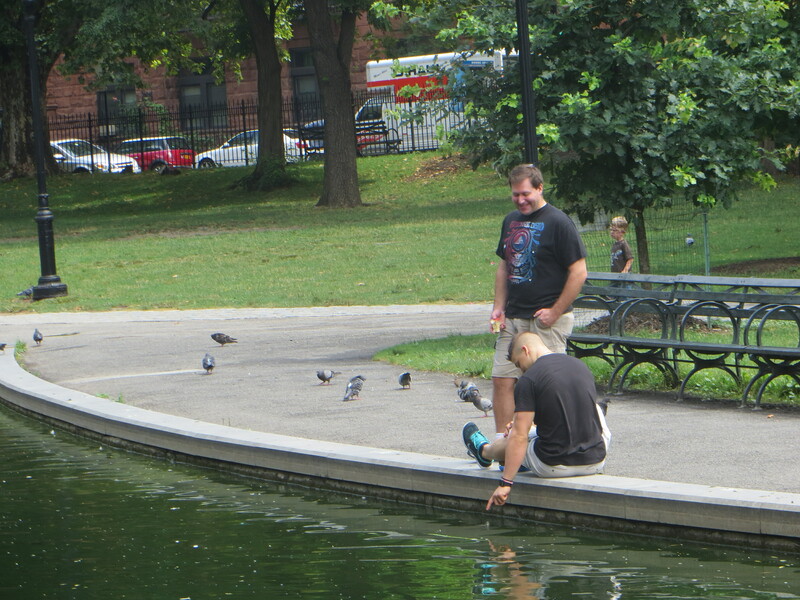 Then the hawk hopped onto the old man’s head and looked out over the park and nearby streets. 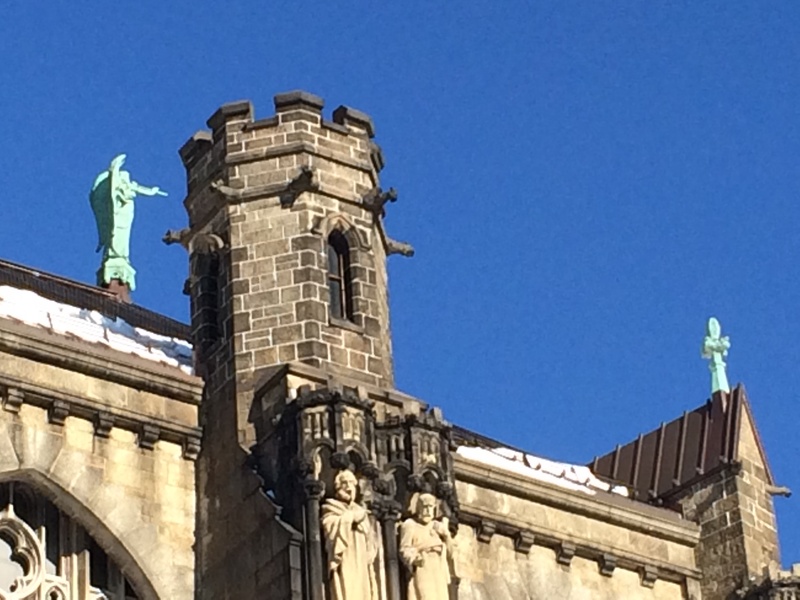 Somehow, the poor saint looked especially sorrowful this morning, and the hawk, well, hawkish. After a few minutes, the big bird spread its wings and soared off to the southeast. 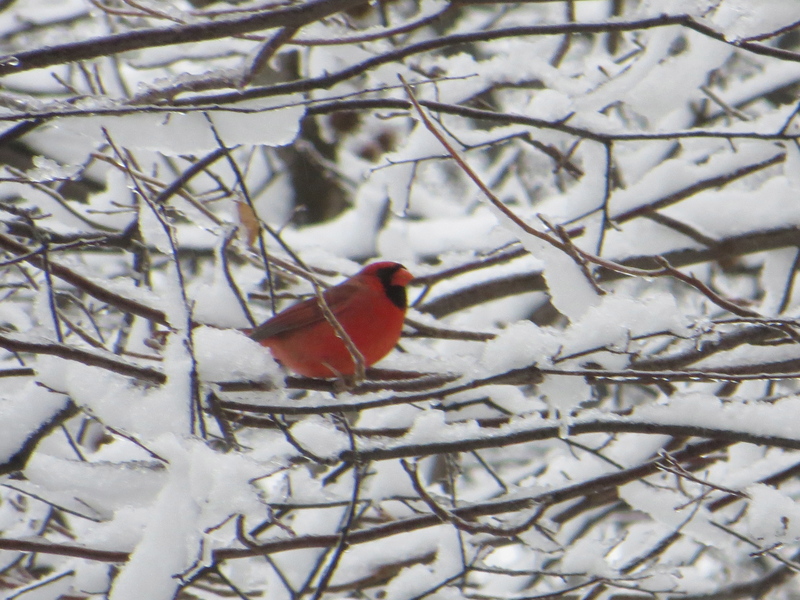 Here are a few images from our snows of the past month. 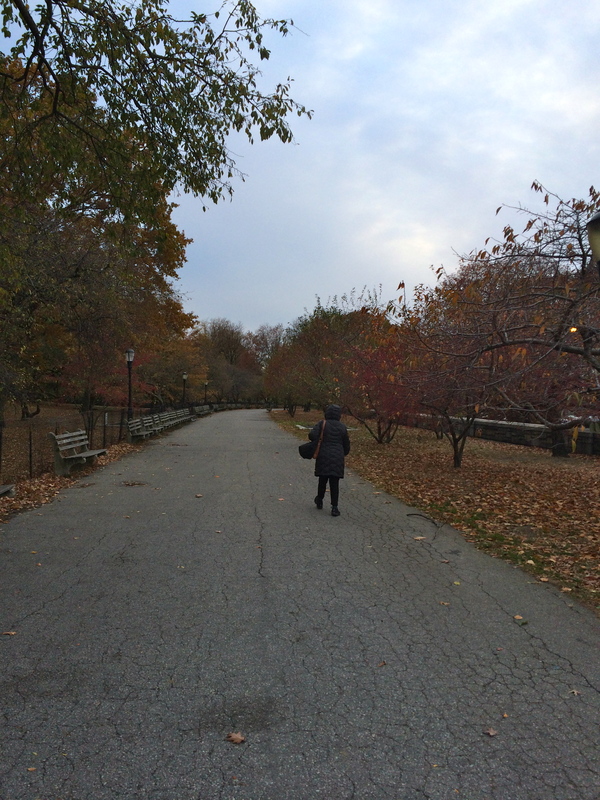 Esau waits for me in Riverside Park. Dog prints on the retaining wall high above the park. Who’s been walking on the wall? 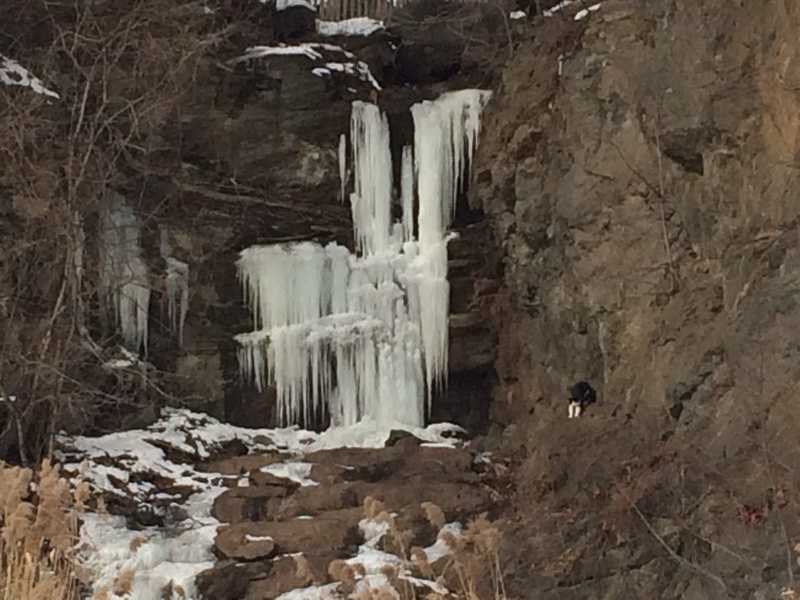 In Morningside Park, a feral cat makes its way along the cliff near the iced-over waterfall. The cat’s white legs look like little ice falls. 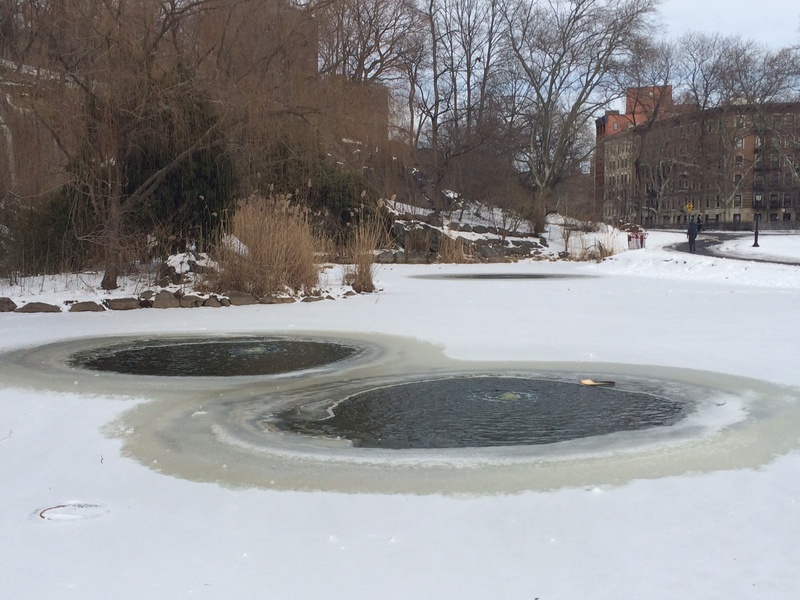 The pond in Morningside Park is sometimes frozen. Other times, some kind of bubble machine prevents it from fully freezing. Bubbling pools in Morningside Pond. 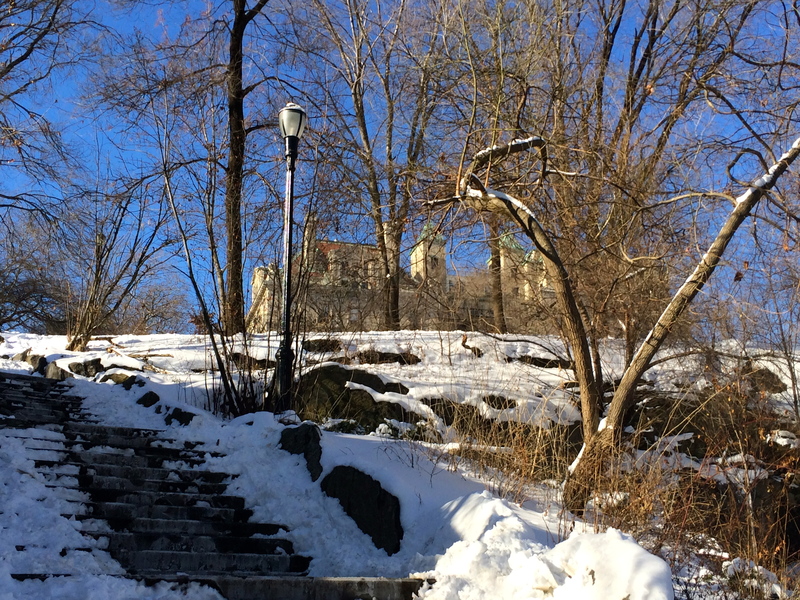 After the snow, the sky clears and a hawk flies over the snowy landscape of Central Park. You never know what you’ll find when you go out walking. 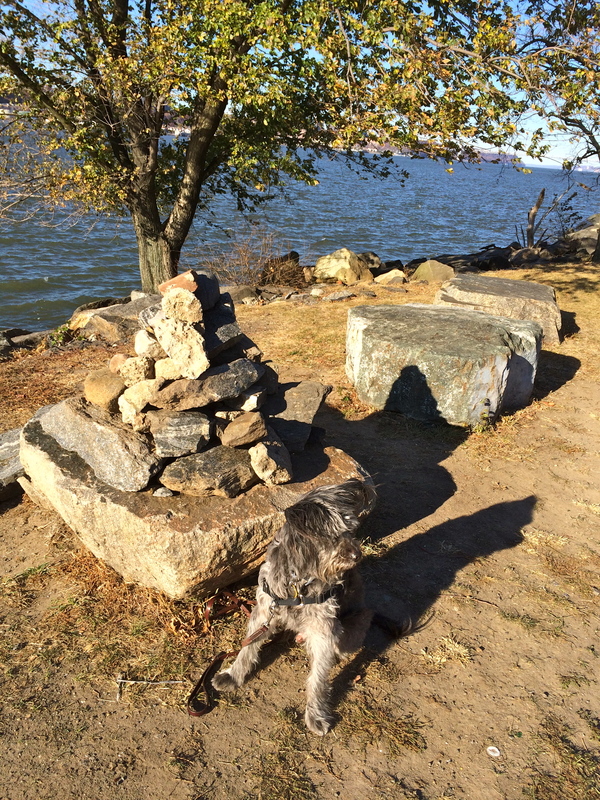 A mysterious ziggurat by the Hudson. Vertical objects, man-made and natural. 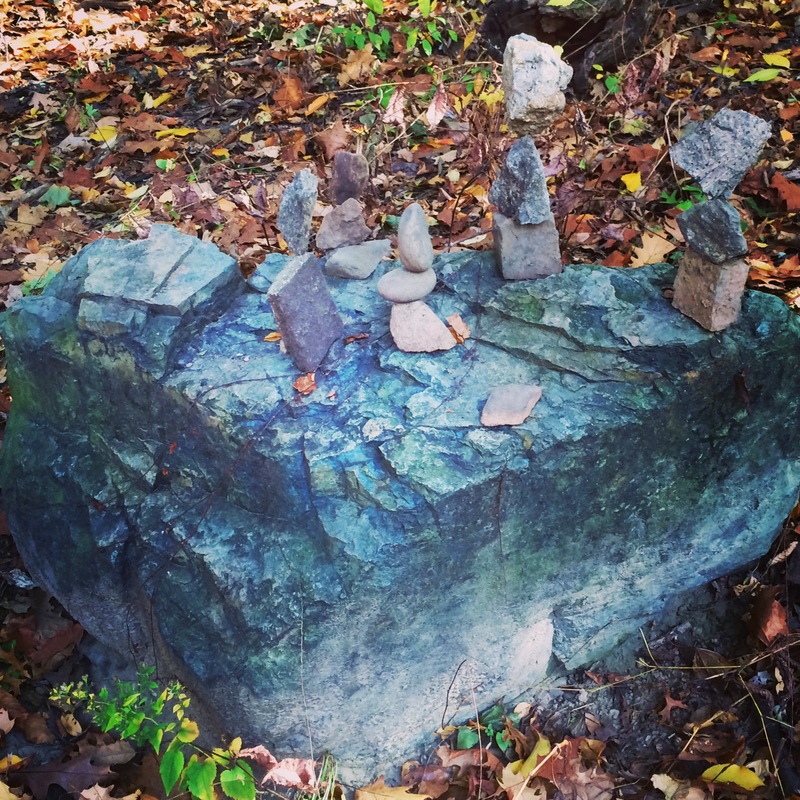 Balanced stones on top of a stone in Riverside Park. 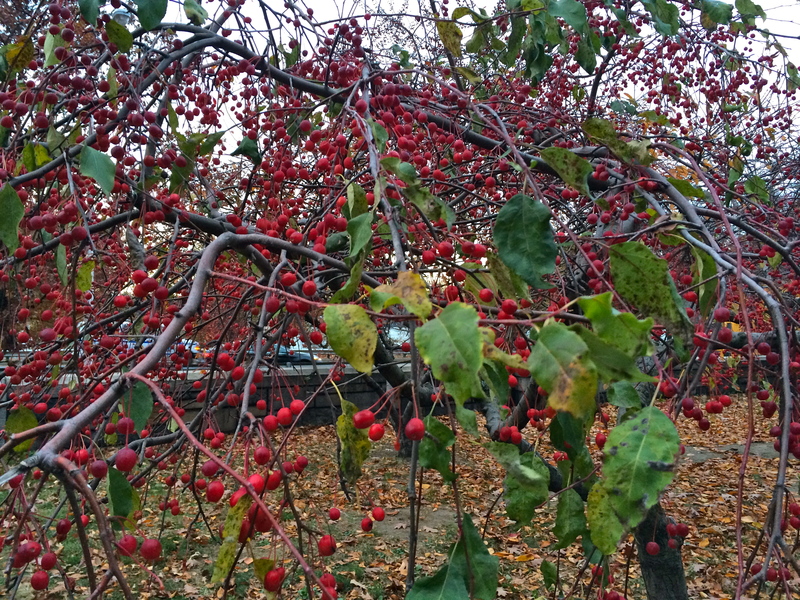 Osage oranges in Morningside Park. Never the same walk twice. My house is a very very very fine house. Lately I’ve been feeling grateful to my walking companion. Just over five years ago, my family and I left the horizontal landscape of Dallas, Texas for the vertical world of Manhattan. 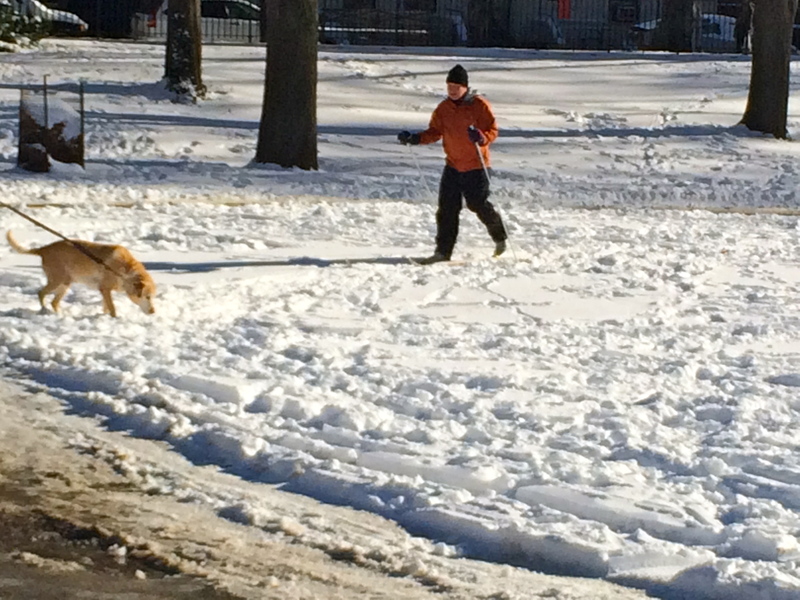 Since then, like old-fashioned postal workers, the dog and I can fairly say that “neither rain nor snow nor heat nor gloom of night” has stayed us from our daily exploration of our neighborhood’s streets and parks. 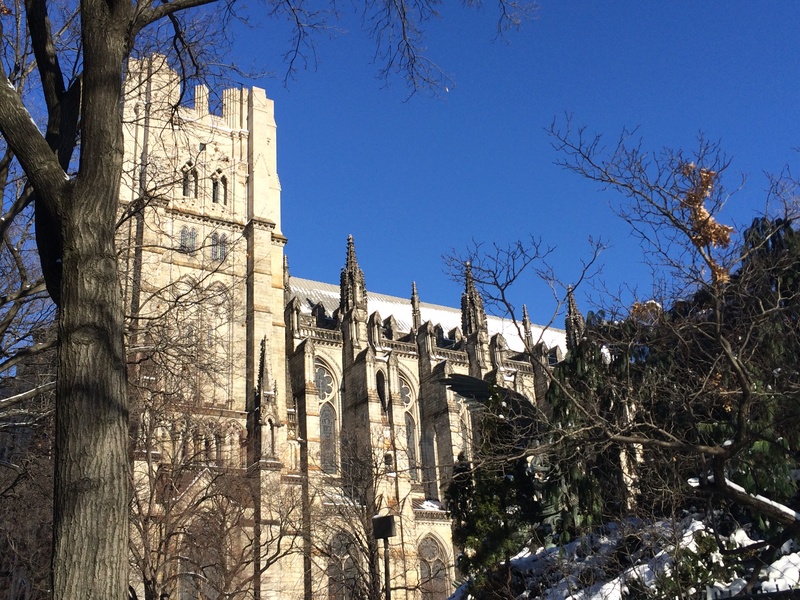 Walking with Esau has led me to discover things about my city and its inhabitants – human, domesticated and wild – that I might never have known if the dog didn’t need to go out, and then go out again. 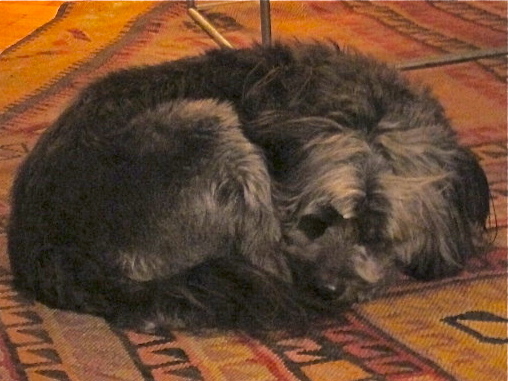 So today I just want to take a minute to admire the dog who gets me up and out, who poses patiently whenever asked, and who valiantly represses his predatory instincts long enough to allow me to watch the hawks, raccoons, squirrels, egrets, sparrows, peacocks, woodpeckers, ducks, and other creatures that share the streets and parks with us. Thank you, Esau dear. You can take five now. 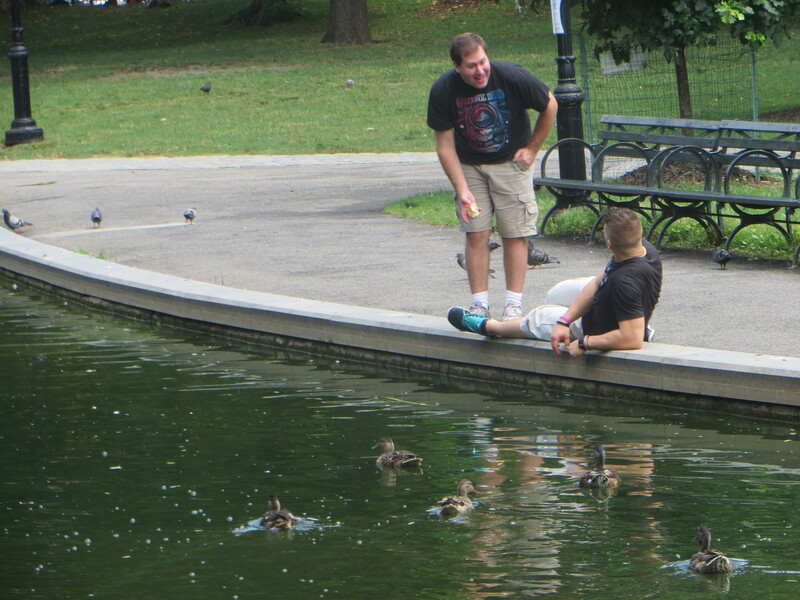 Morningside Park is lush and full of animal and human activity these days. 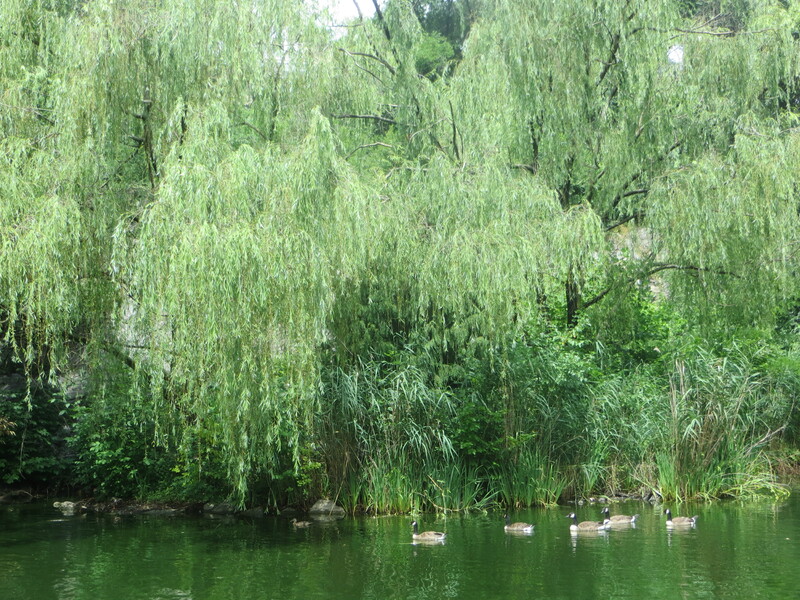 A goose family swims past the little island in Morningside Park. 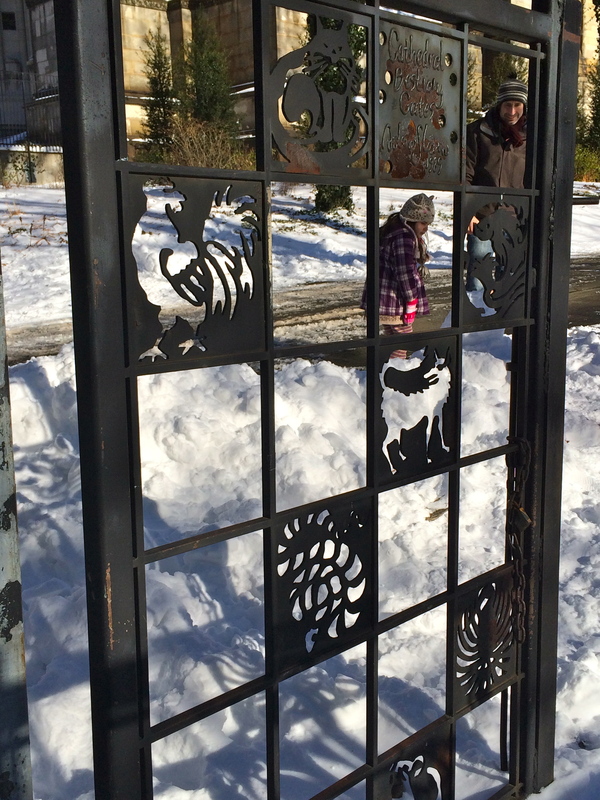 On Saturday, a small brigade of dedicated kids and volunteers cleaned the park and the pond. A turtle bobbed persistently for an elusive bite of apple. 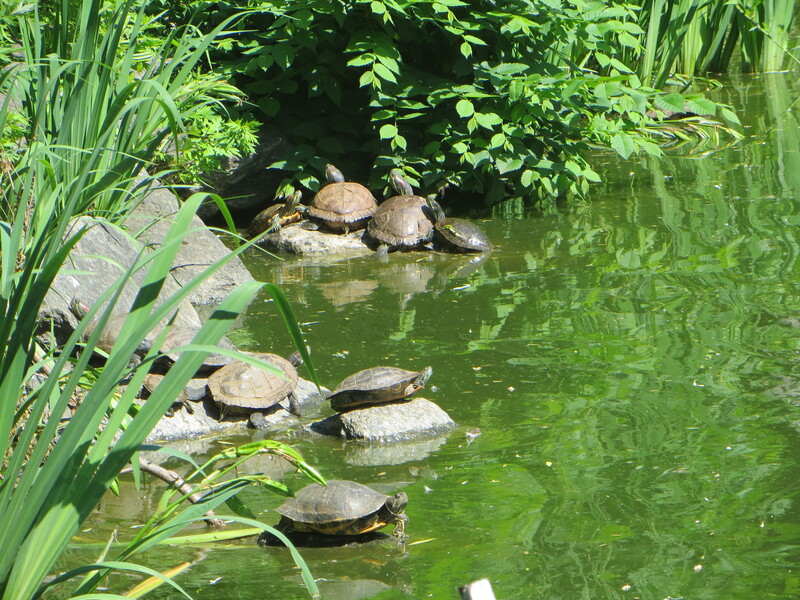 Scores of turtles swam and basked near the pond’s mallard ducks. 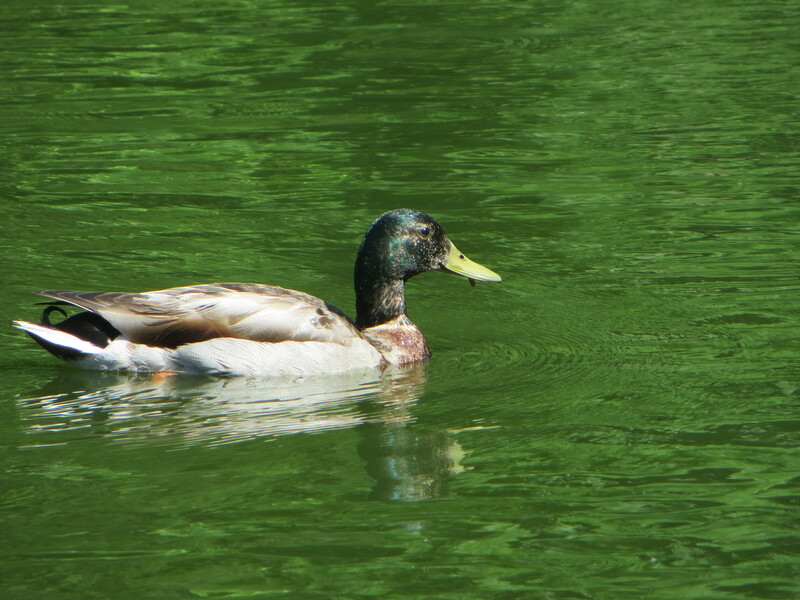 The mallards are molting, which is why it looks at first glance as if there are nothing but females on the pond. Look a little closer, though, and you’ll see that some green is still visible on the heads of the birds in the photos, indicating that they are, in fact, males. The bright yellow of the bills is also a good marker; the bills of females are orange and brown. 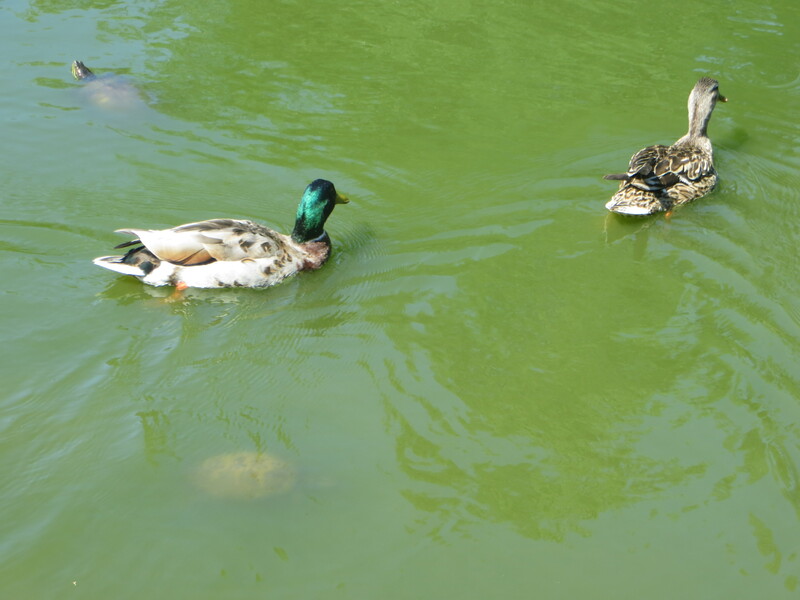 After breeding season, mallards molt and become temporarily flightless. The males lose their distinctive feathers and go into “eclipse plumage,” which resembles the mottled coloring of the female. I’m not sure whether these boys are on their way in to their molt or on their way out. But in any event, within a few weeks, dull feathers will be replaced yet again with recognizable, jaunty bright colors. This turtle reminded me of the White Rock Soda girl. What do you think? Two young men with baseball gloves were captivated by the turtle on the rock. “I haven’t seen a turtle in, like ten years,” said one. When he realized there were turtles everywhere, swimming just beneath the surface of the water, he couldn’t tear himself away from the pond. Soon a group of ducks swam over, hoping for a hand-out. 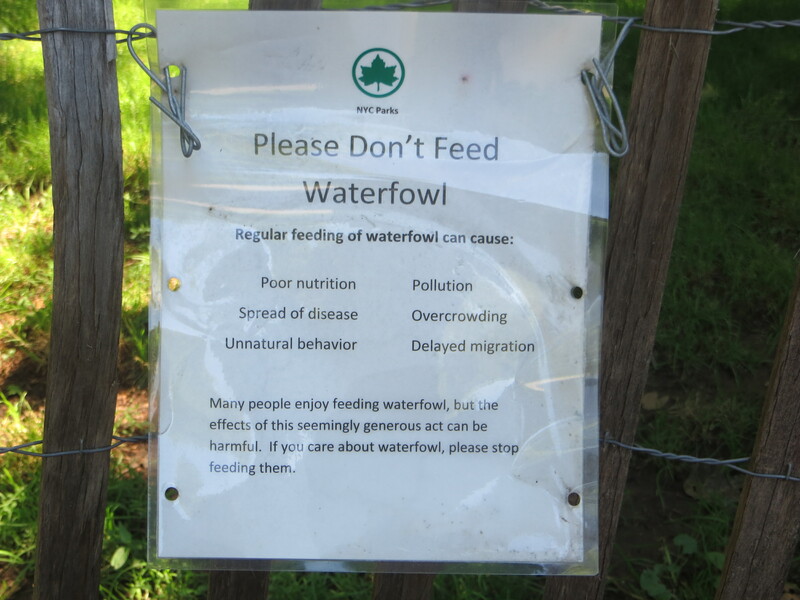 An interesting new sign has appeared near the pond, in addition to the “Do Not Feed the Wildlife” notices that are often displayed. 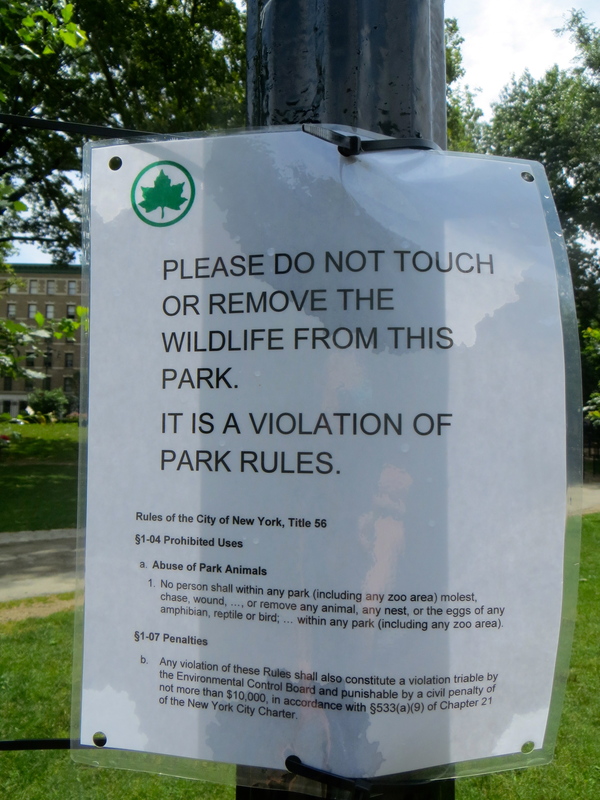 Do not touch or remove wildlife from park. Really, my fellow citizens, what have you been up to while I’ve been away? 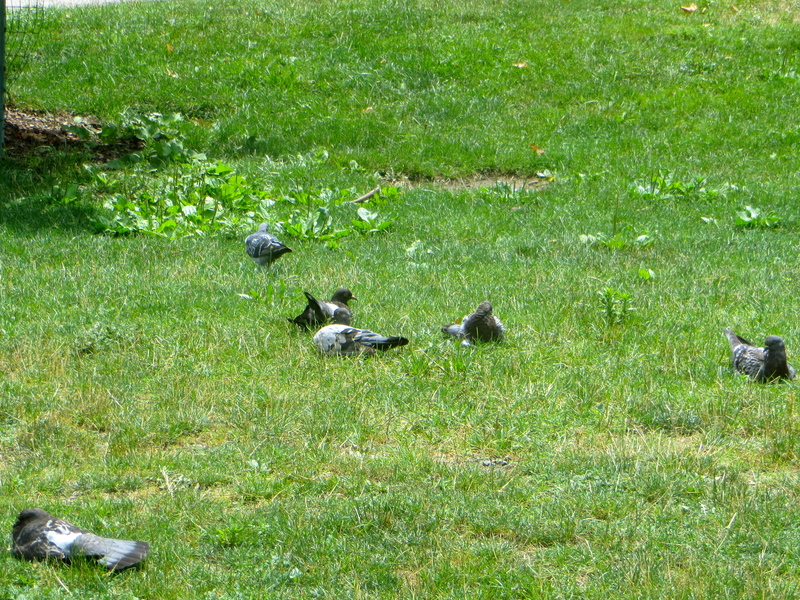 A large flock of pigeons lay about on the grass across the path. 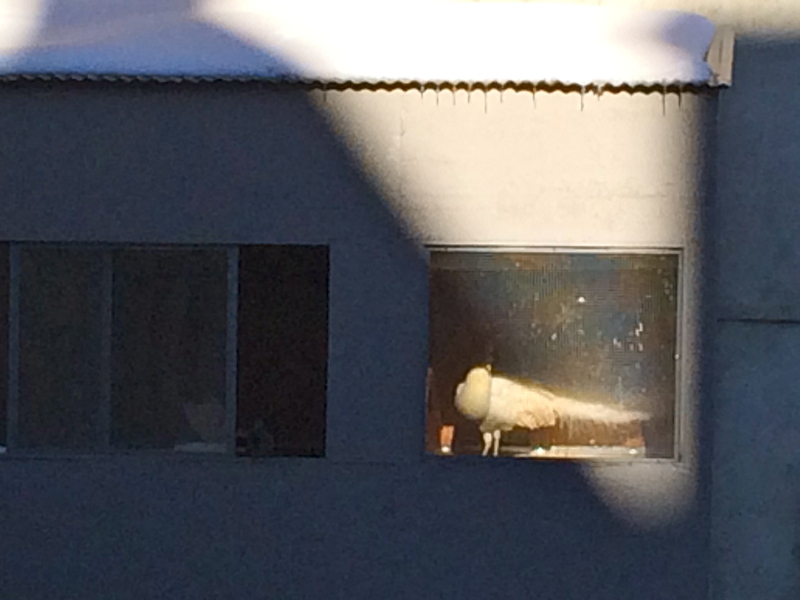 Nap time for pigeons. 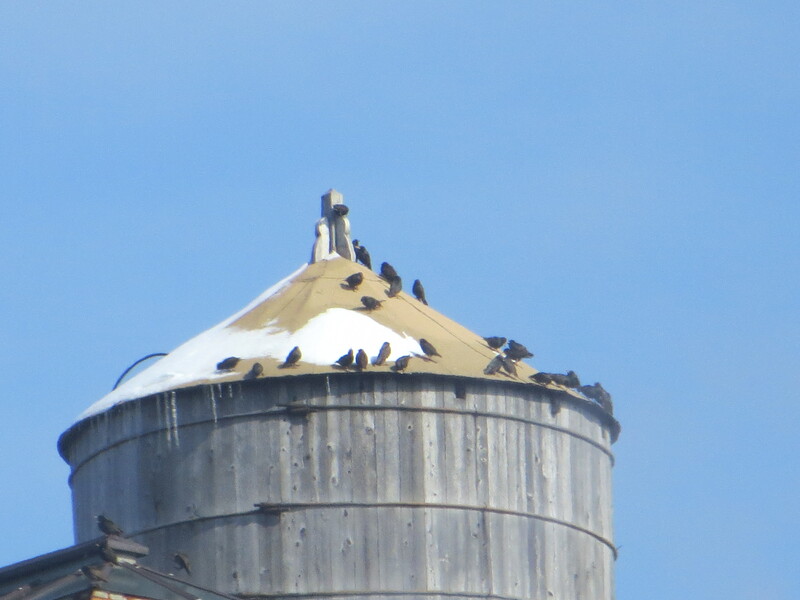 These are just a few of a very large flock, almost all recumbent. Nearby the turtle-watchers played catch. 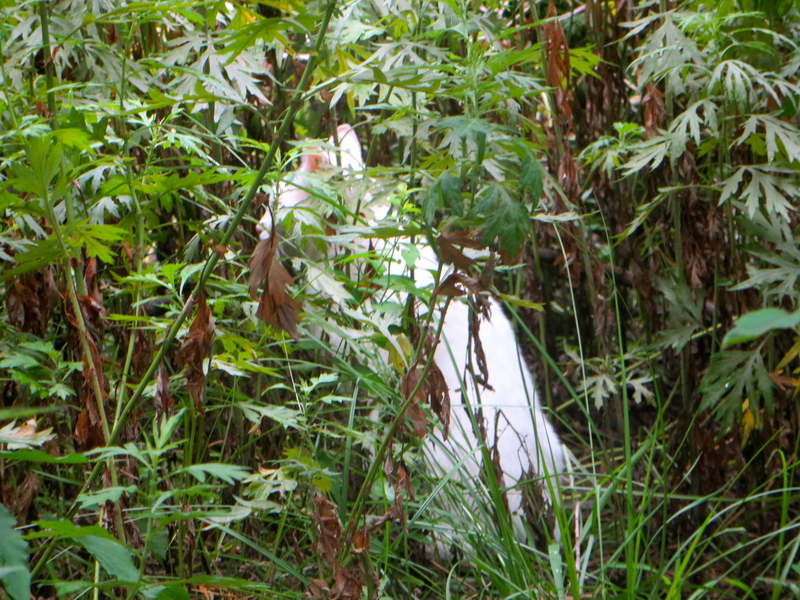 As we headed up the grand stone staircase, I spotted a feral cat mostly hidden in dense vegetation. Interestingly, the dog had no idea the cat was present until I stopped to take its picture. On the grassy slope just below Morningside Drive, a girl sat in quiet meditation. 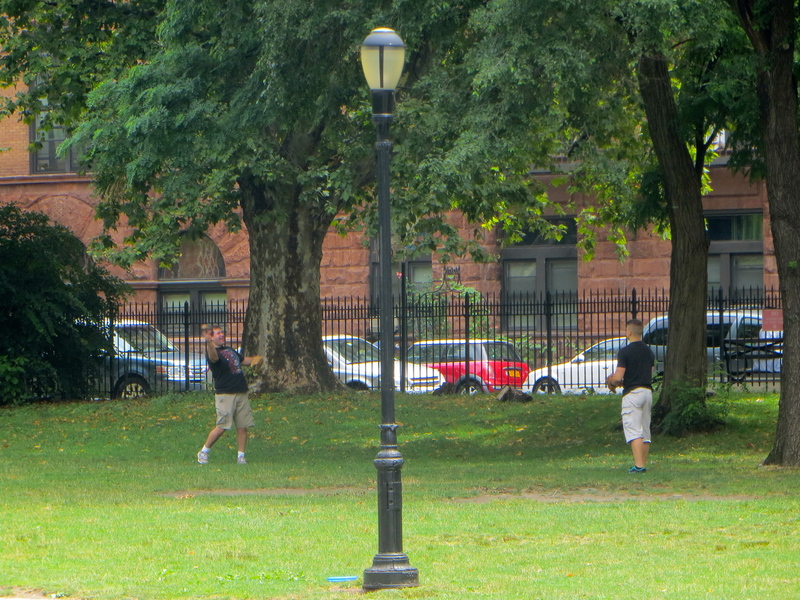 Just another summer Saturday in one of my favorite New York parks. All the rain we’ve had recently means the animals in Morningside Park are living the lush life. 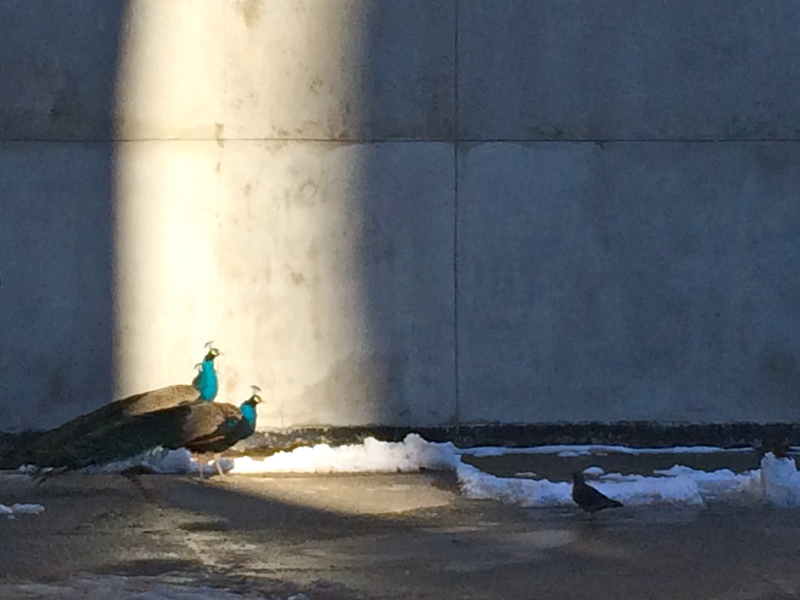 And the sunshine brings out sunbathers. Turtles are everywhere, on the rocks and in the water. 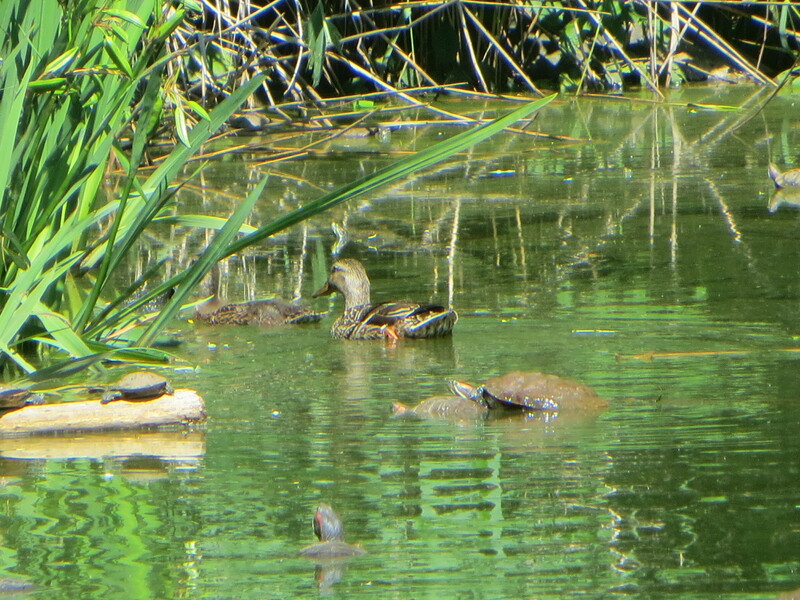 Today, mallards and turtles are the dominant species in the little pond. 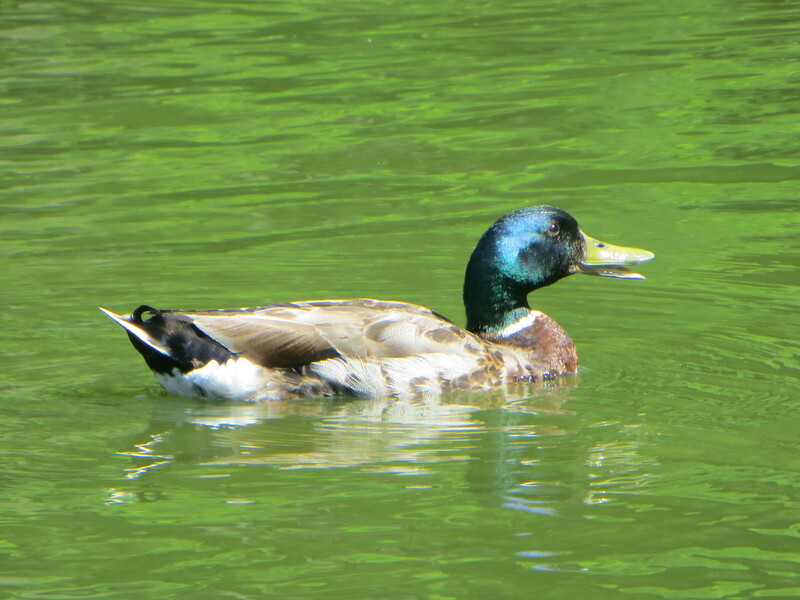 Now that the excitement of breeding season is over, male mallards are molting into eclipse plumage. 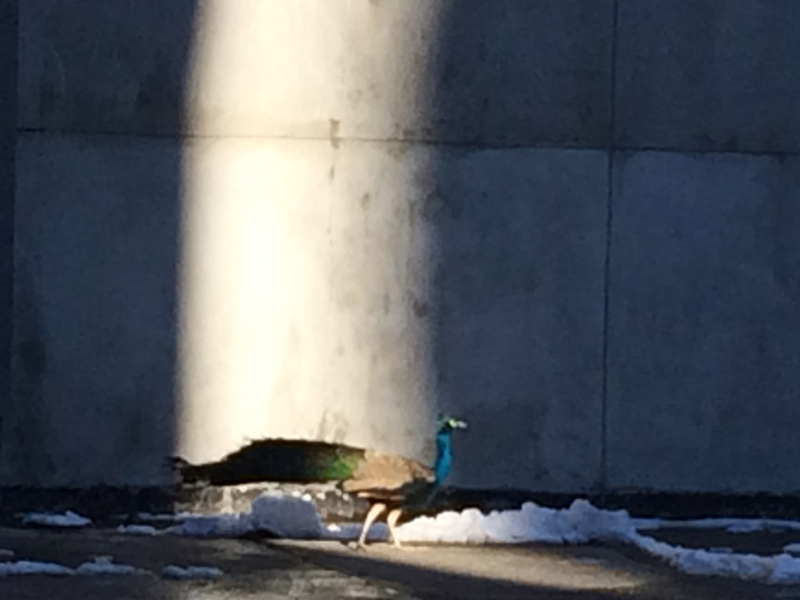 Drab feathers replace the brilliant iridescence of breeding plumage. Not every bird is on the same schedule. The head and neck of the duck below glitters and shines, although he is well into his molt. Still breaking out the bling. Each year during their molt, ducks lose their flight feathers, rendering them especially vulnerable to ground predators. 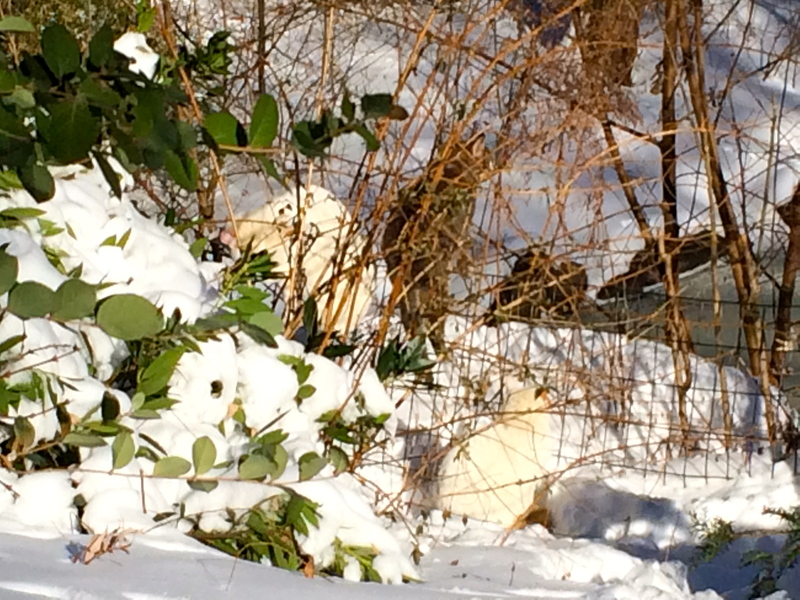 What ground predators, you may wonder, do ducks have to worry about here in our urban park? Well, feral cats, dogs off the leash and, possibly, raccoons. 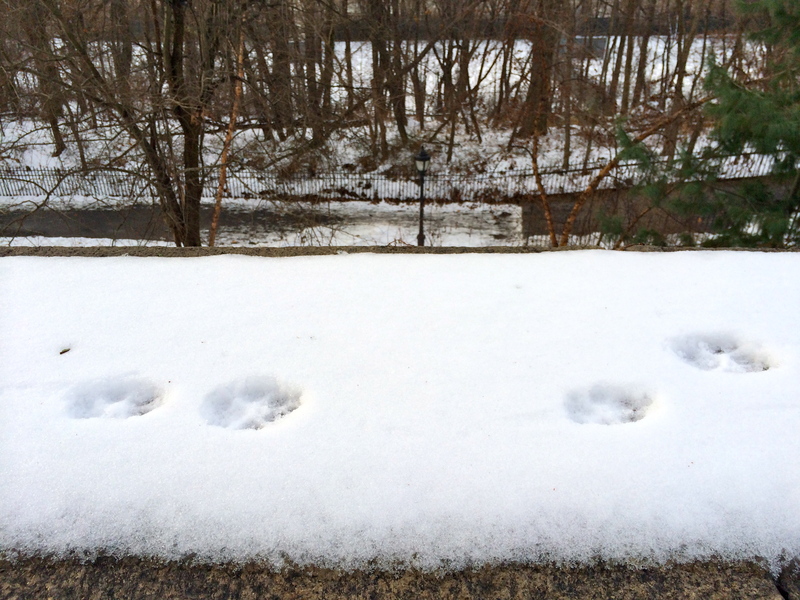 Morningside Park’s feral cats have been more visible than ever this past winter and spring. It’s no coincidence that someone is regularly feeding the cats. 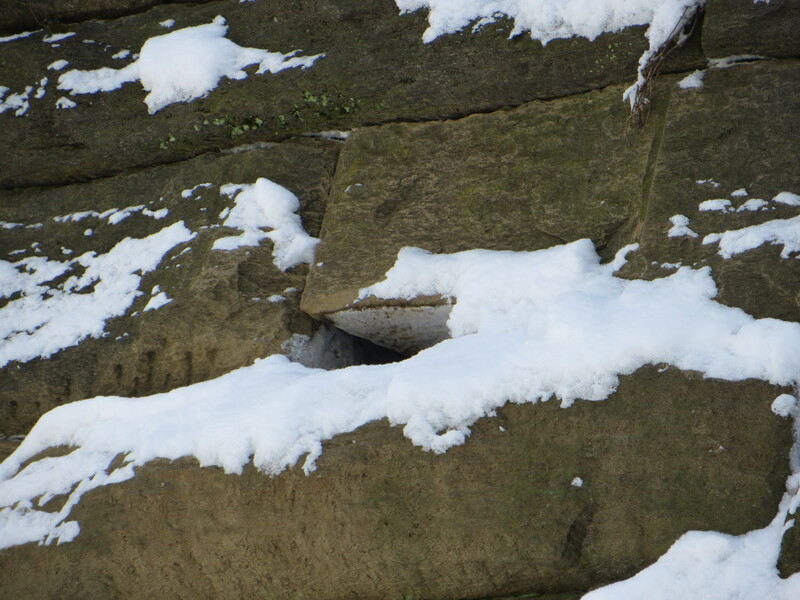 The spot for the feedings is right by the great stone staircase, on the cliff behind the pond. 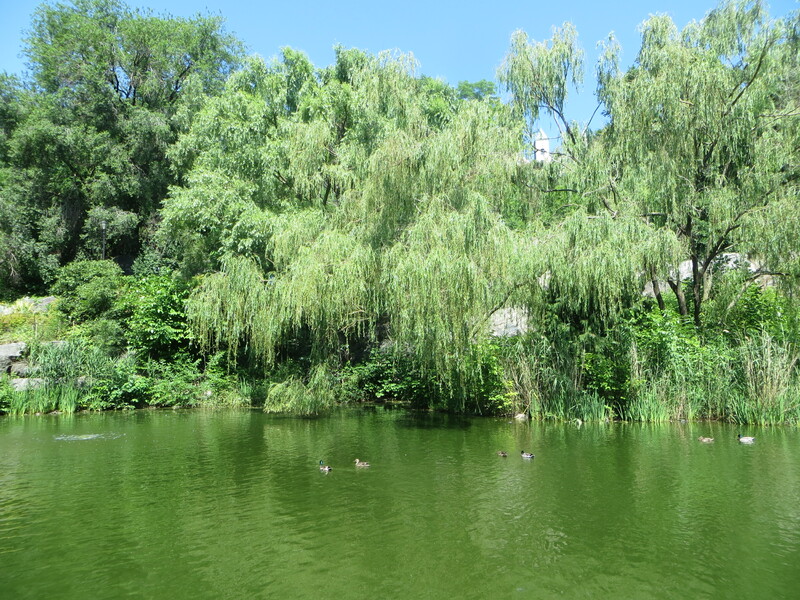 The pond and its surrounding vegetation draw nesting ducks as well as sparrows, cardinals, red-winged blackbirds, robins, night herons, egrets and many other species. The cats are beautiful animals, and I understand the impulse to care for them. I understand trapping, neutering, vaccinating, and releasing them. But feeding them? Given what we now know about the devastation to North American songbirds since cats were established in the New World, do we really want to be feeding them? 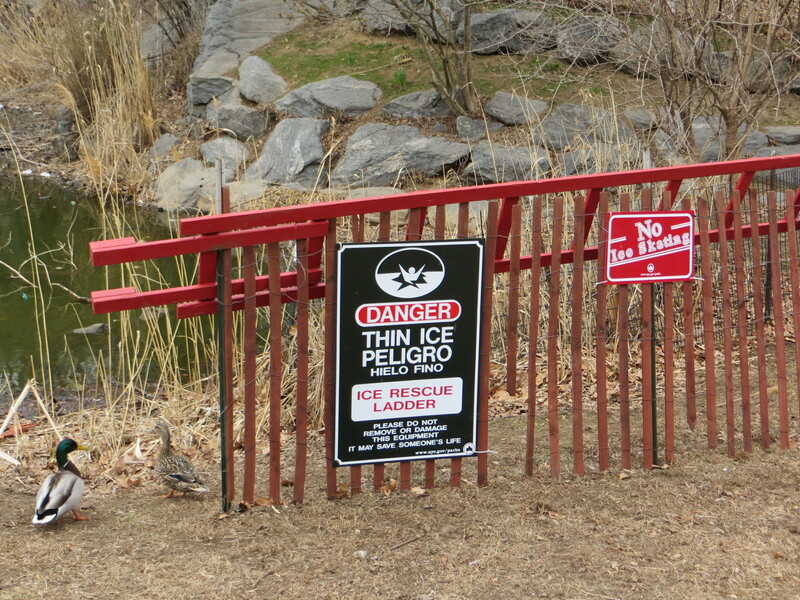 We know a lot about the negative impacts of feeding wildlife, and I was happy to see these signs in Morningside Park. The signs address intentional feeding. But inadvertent feeding, in the form of trash and dropped food, is what keeps our rodent population so healthy – and I’m not just talking about squirrels, like the one below. 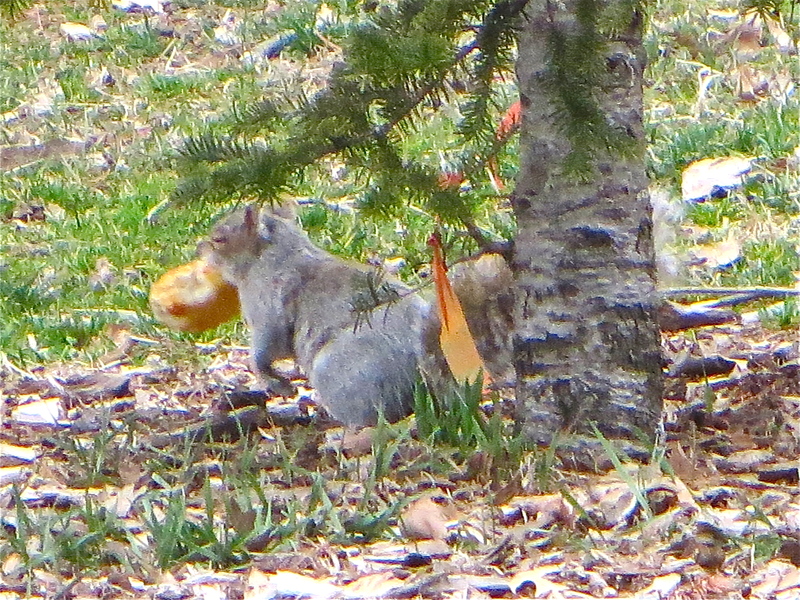 Squirrels don’t need bakery rolls. Our urban ecosystem works best without hand-outs. Let them forage for themselves. Today is a little chillier, but the last few days have made the birdies sing. Here is the song I heard them singing. Oh, it’s spring. 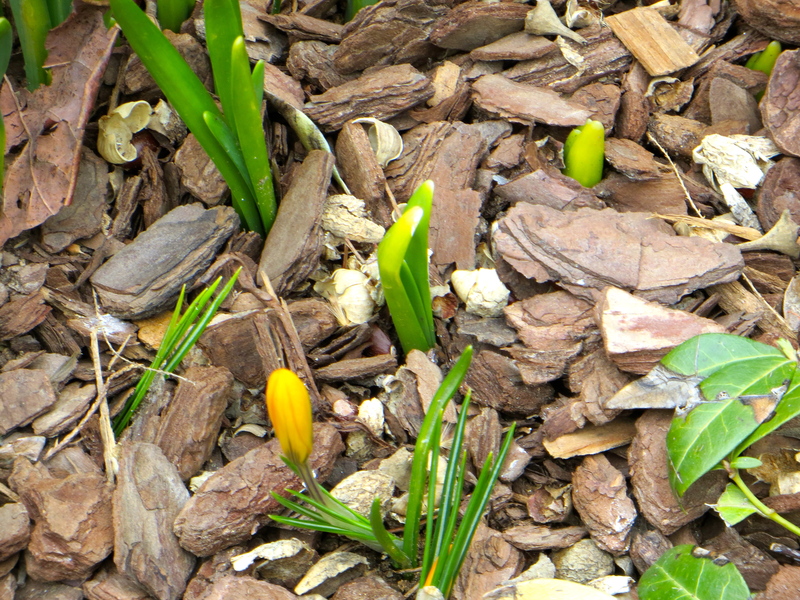 Yes, it’s spring. Yeah, it’s a beautiful day. 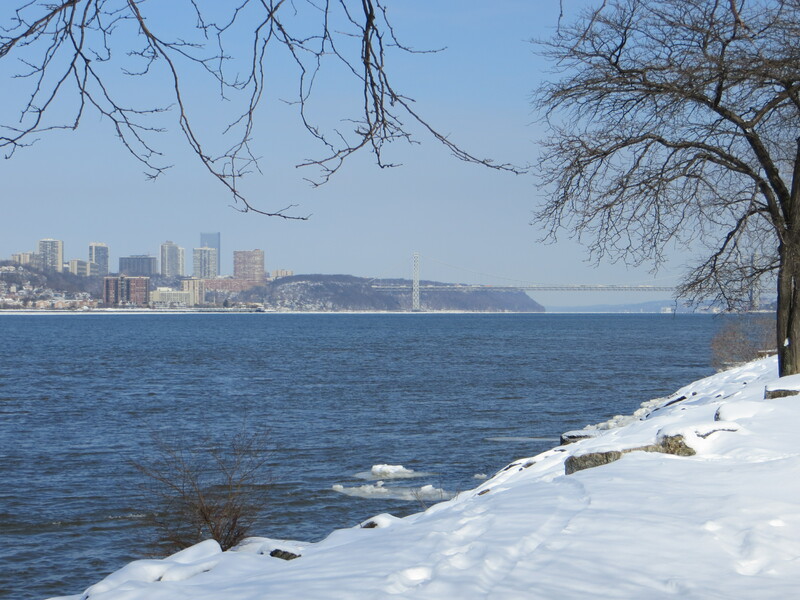 Walking just got easier along Riverside Park’s upper promenade on Riverside Drive. 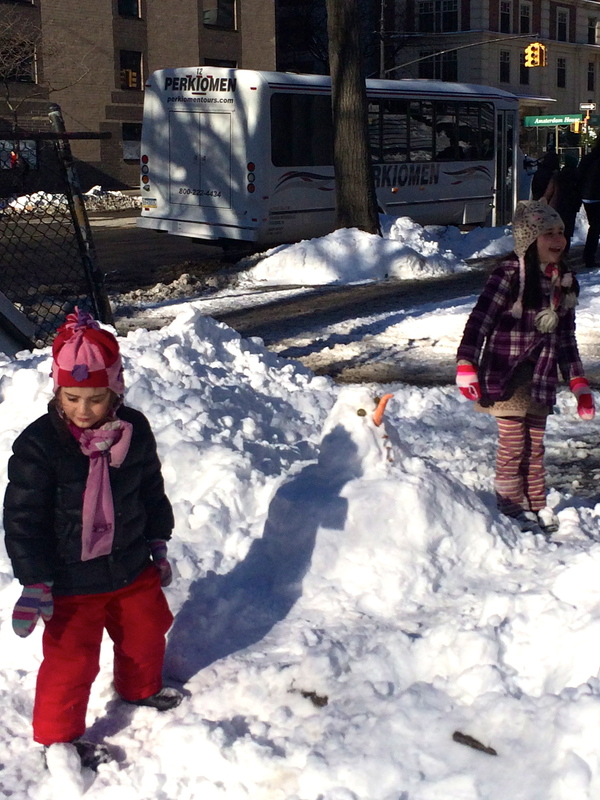 On Wednesday, it looked like this at 107th Street and Riverside Drive. But yesterday, all that was left of the tree was sawdust and a pathetic bit of stump. Gazing south to 105th Street, we spied the heroes of the scene toiling away on yet another downed tree. 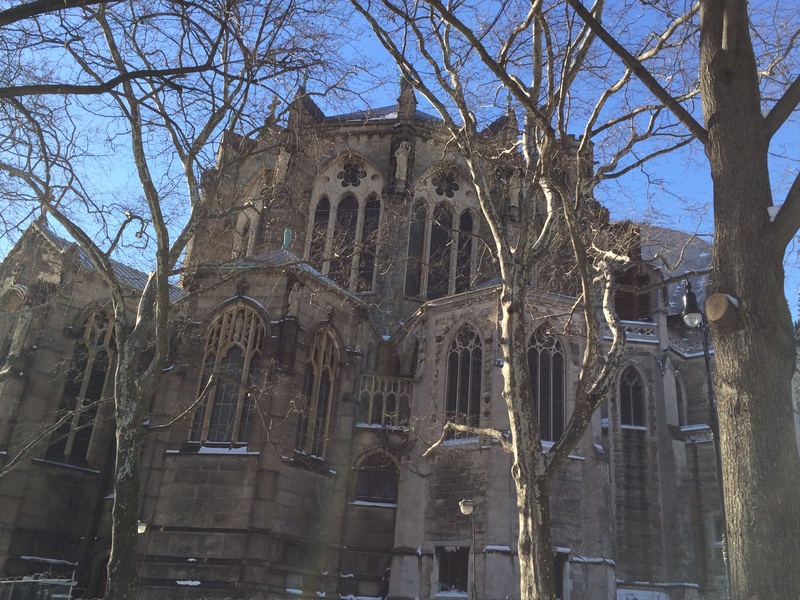 The tree crew from East Greenwich Tree Service has been working in Manhattan since Sunday. Yes, Sunday. 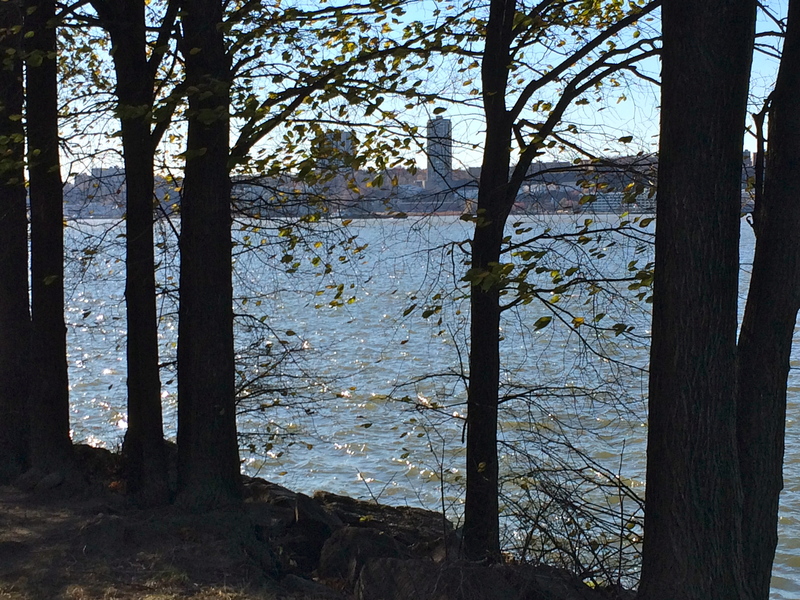 The city hired them to cut down potentially hazardous trees before Sandy reached its peak. 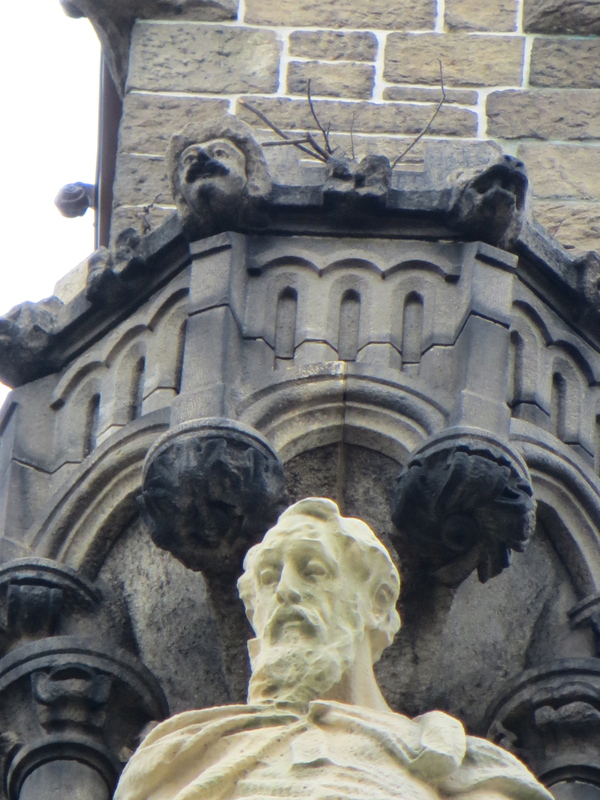 This gentleman told me of working up in the bucket on Sunday in 50-mile an hour gusts. He also showed me impressive photos on his iPhone of cars smashed by trees. He said he likes to take the photos before they clear the trees, and he remembers exactly where each car was located. 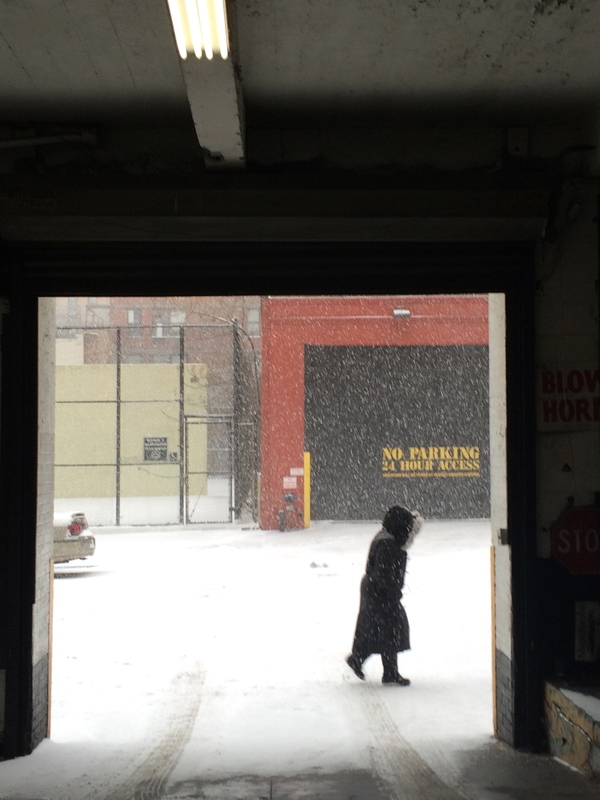 The job now is to clear streets and sidewalks. After that, they’ll move into the parks. And in fact, directly below the team inside Riverside Park, a large tree with a huge root ball was blocking the upper path. To get a sense of just how huge, look at the little pedestrian coming along the path on the left. A man from the Parks Department conferred with the team. 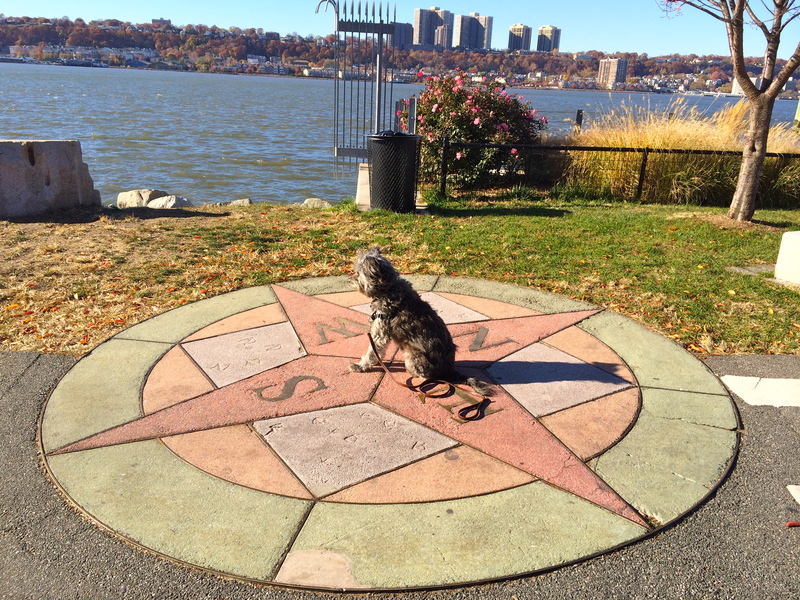 I asked him how much damage Riverside Park had sustained. He said he didn’t know exactly, since his priority has been to clear the streets for emergency vehicles and to keep people safe. 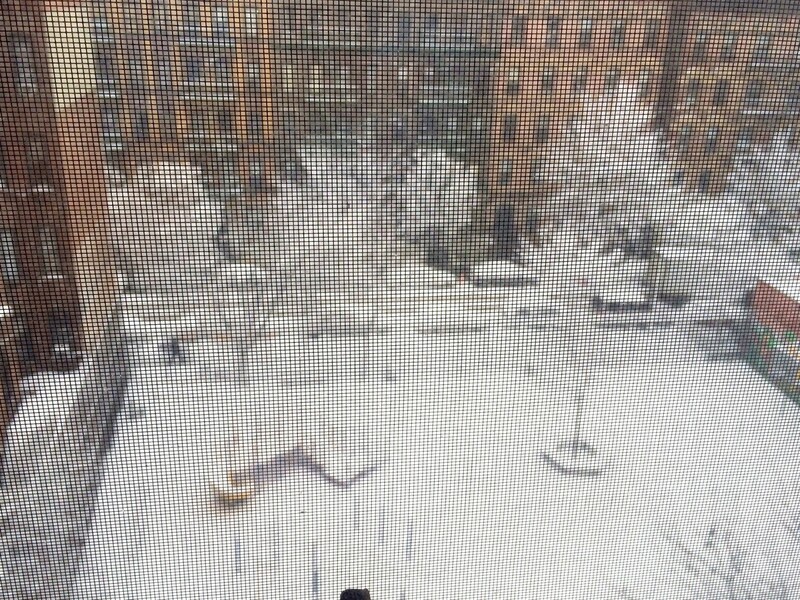 The tree at 105th Street took part of the playground fencing with it. 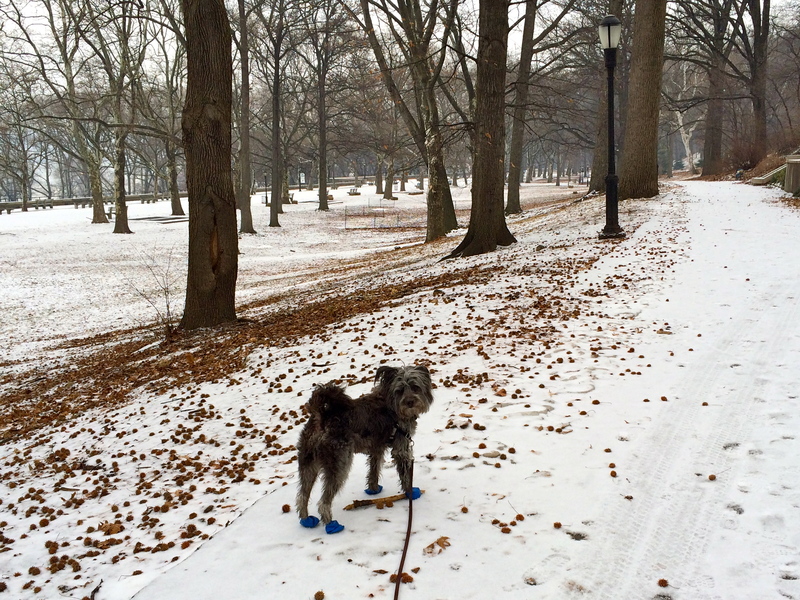 I told him I had heard that Morningside Park had lost a lot of trees, which he confirmed. 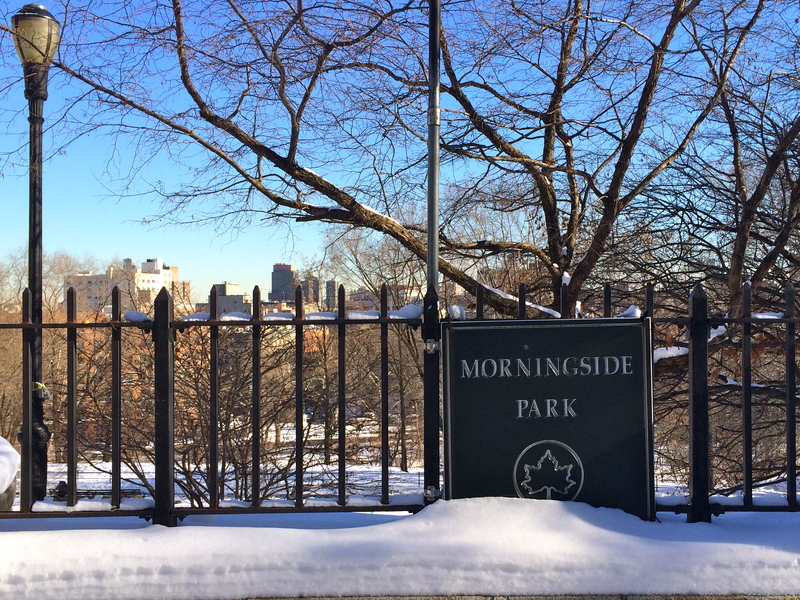 (Scroll down for information on volunteering tomorrow in Morningside Park or your local park.) 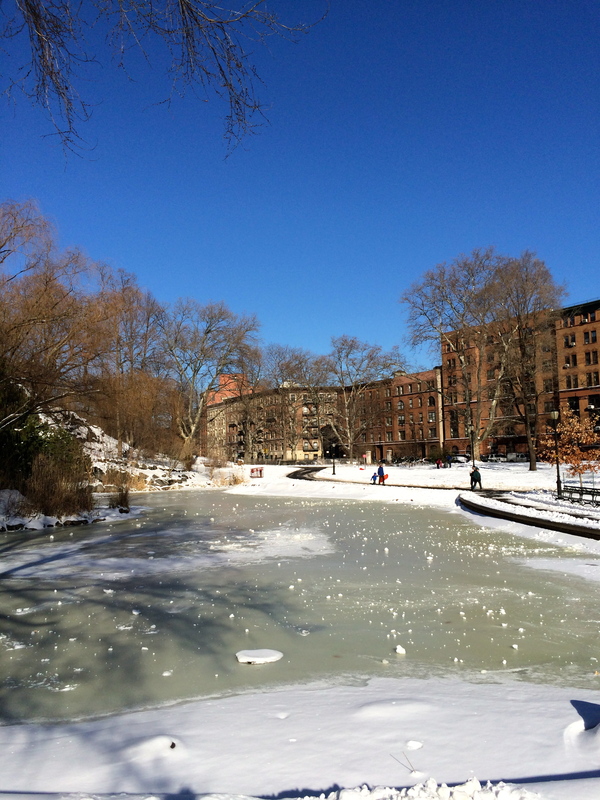 We talked about the storms over the past couple of years that have caused our parks to lose a substantial number of trees in the parks, including last October’s freak snow storm that took down 1,000 trees in Central Park. And they – I mean, we – are going to have to face the facts about climate change, and come up with new ways of living and working to protect our city and our planet. Meanwhile, thanks to the tree guys for their hard, necessary work. Dress for outdoor work. Equipment will be provided. Email info@morningsidepark.org to let the Friends know how many people you will be bringing. 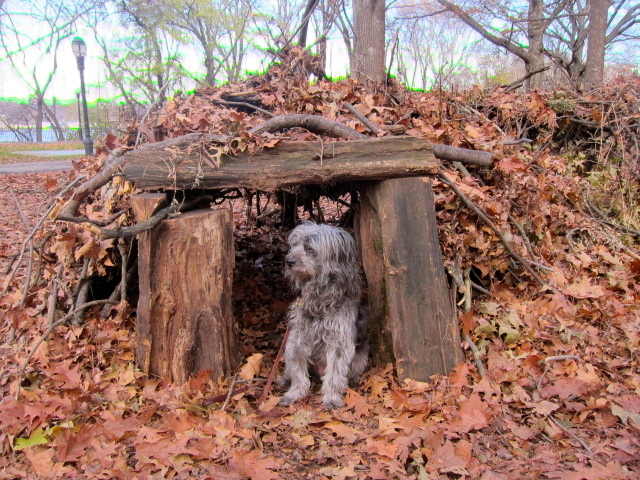 To find out about other volunteer opportunities, check NYC Services or your local park, shelter or ASPCA. 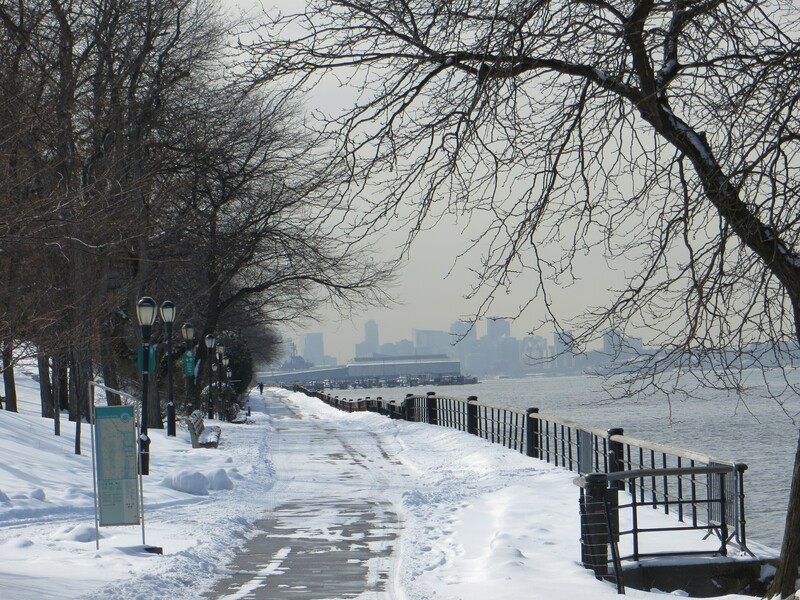 I just received emails from Kicy Motley at kmotley@pubadvocate.nyc.gov that there are clean-ups going on tomorrow in Staten Island and several locations in Riverside Park. email for info. I’ll post more volunteer links soon. Once upon a time, cats were common fixtures in NYC stores, greeting customers in the doorway of the fishmonger or lounging in a patch of sunlight among resoled boots in the display window of the shoe repair store. The corner deli, the candy store, and the Chinese laundry – Manhattan’s equivalent to the butcher, the baker, and the candlestick maker – each had a resident feline. They weren’t pets, these cats. They were working animals, who paid for their room and board by working nights in rodent control, and days in customer development, allowing people like me to scratch their ears. Several cats still work my stretch of Broadway. Most impressive is the fine, fat beast attached to Samad’s Gourmet between 111th and 112th Street. Friendly and self-assured, the cat loafs outside the store in fine weather, and has been seen trundling into neighboring shops, just to say hello. On a mild January day, it helped out in the sales department of the neighborhood vintage record seller. Would you buy a used record from the cat? But not all neighborhood cats are living the good life of Samad’s cat. 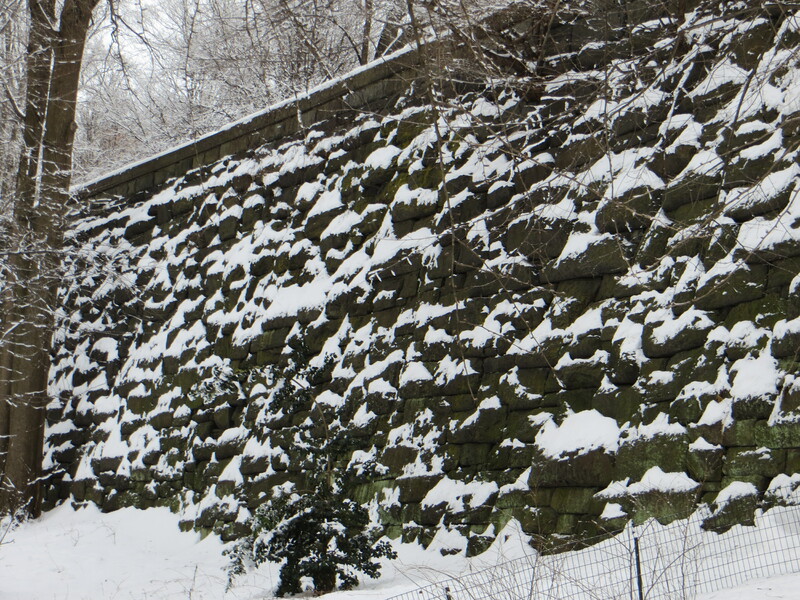 Ten days ago, I encountered this black cat on the retaining wall of Riverside Park. Maybe the cat is on the lam from a nearby apartment. 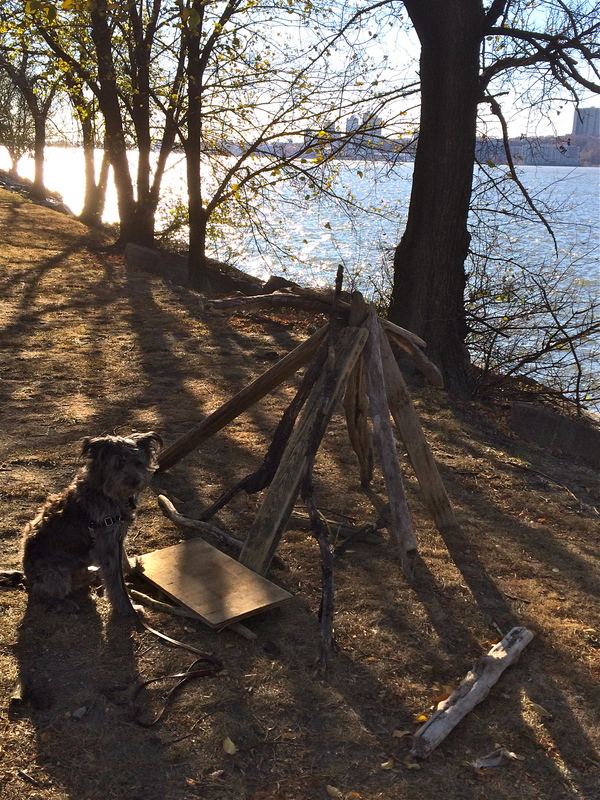 Or maybe it’s a member of Riverside Park’s small feral cat colony, which shares an indoor space with the occasional homeless person. Riverside Park cat colony. Photo from April 2010. Volunteers have trapped each animal, and taken it to a veterinarian where it is neutered or spayed before being returned to the park. By preventing the cats from breeding, the proponents of the Trap-Neuter-Return program hope the colony will eventually die out. Feral cat in Riverside Park, 2010.
Who else eats at this buffet? and advocate for the protection of the cats. 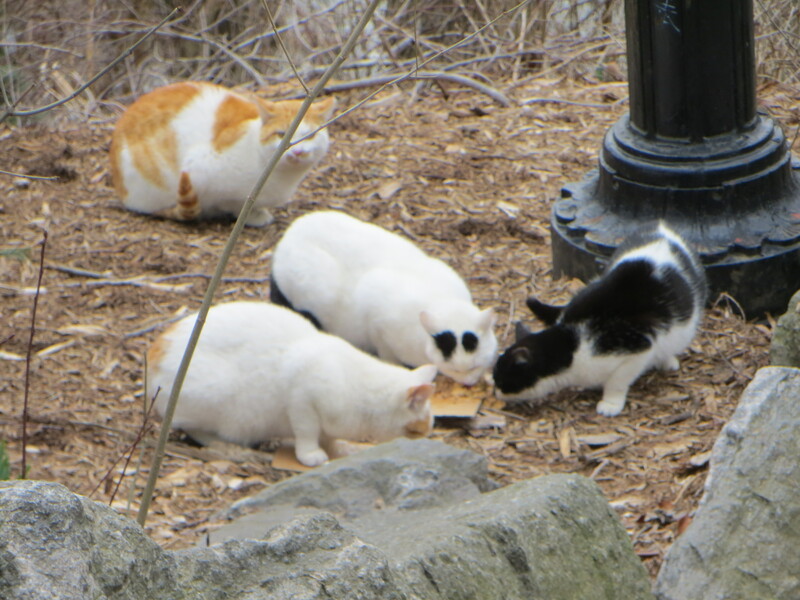 I don’t know how many cats are cared for in Riverside Park, although I have never seen more than three. But surely, as the presence of the black cat on the wall indicates, there will always be a new recruit, whether an unwanted pet dumped in the park, or a runaway in search of greener pastures, finding its way to the easily accessible food and shelter. Don’t get me wrong. I love cats. Pudding (1999-2012), an indoor city cat, ponders what to read next. But if cats are truly an invasive species causing potentially serious harm to the ecosystem, then free-roaming cats raise surprisingly complex and far-reaching questions, among them how to ethically and humanely manage feral cat colonies and even our own pet cats. Feral cats are found all over New York City in parks, parking lots and alleys between buildings. 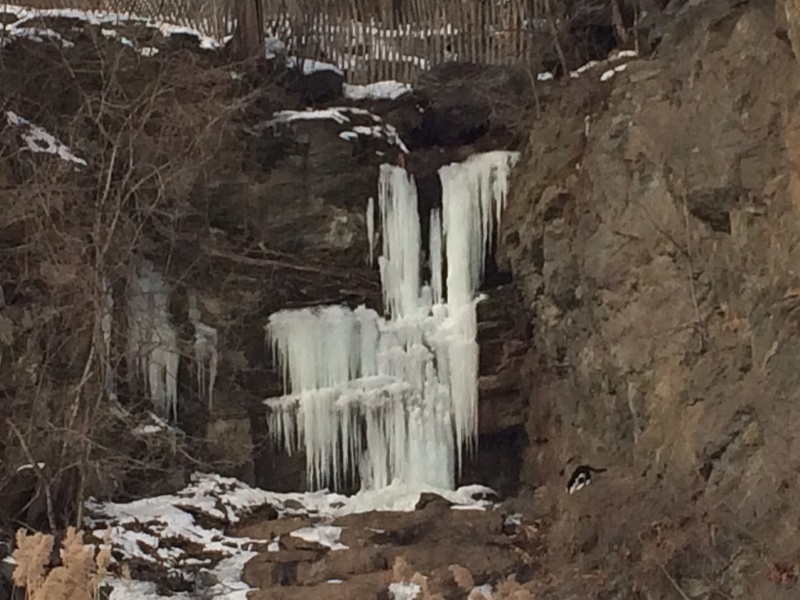 A small colony lives in Morningside Park. With its population of ground-nesting birds, its rough terrain and bushy undergrowth, Morningside is well-suited to the little feline predators. 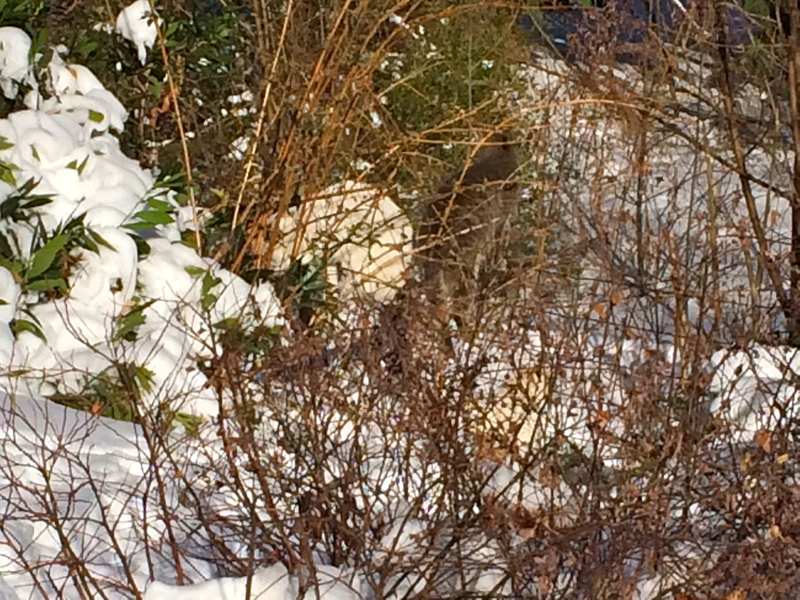 White cat soaks up some rays on a mild January day in Morningside Park. 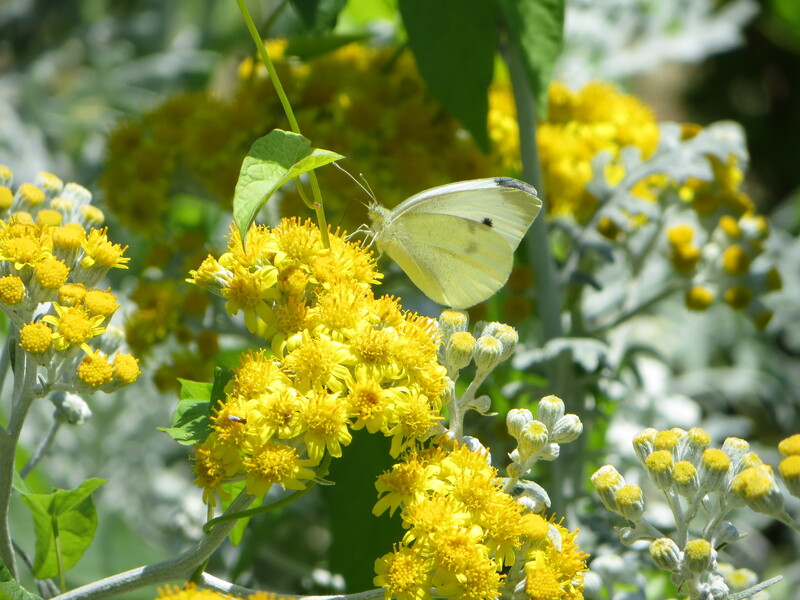 while its sibling, or friend, keeps pale green watch on passing humans. while a few blocks away, on a rare grassy patch, two kittens hone their predatory skills with a game of hunter-and-prey. Readers, I welcome your thoughts on cats, both feral and pet. 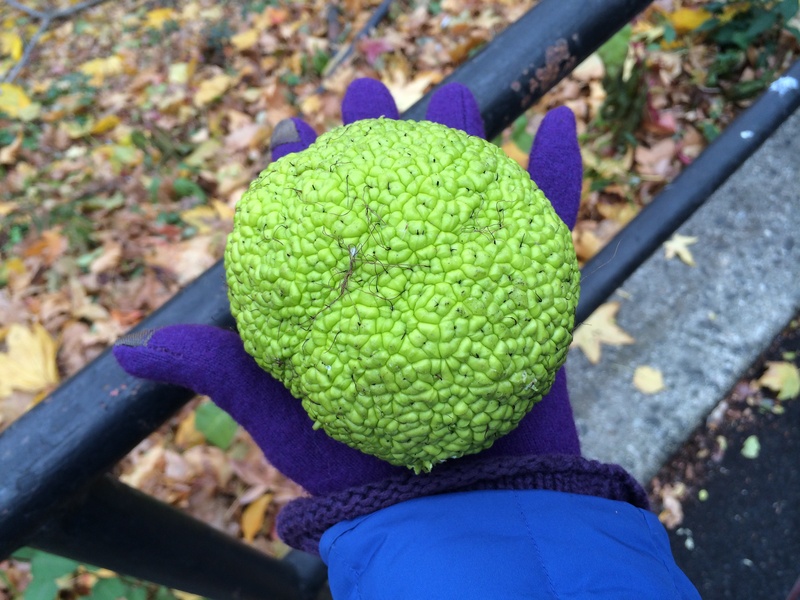 On a recent walk through Morningside Park, Osage Oranges, also known as hedge apples and horse apples, littered the path below Morningside Avenue. The Osage Orange is a curious tree. Native to eastern Texas, Oklahoma, and Arkansas, its wood was used by the Osage Indians to craft superb hunting bows. French trappers who encountered the native population and their bows named the tree bois d’arc, literally meaning “wood of the bow.” In the Protean, shape-shifting tradition of living languages, the bois d’arc eventually transformed into the Bodark tree. “Growing up on the prairies of Oklahoma, one of the first trees I learned was the hedge apple or bow dock, as we ungrammatically called it,” wrote Gerald Klingaman, retired University of Arkansas Extension Horticulturist in a brief and lovely article on the Osage Orange. According to Klingaman and other sources, settlers in the Great Plains planted the fast-growing Osage Orange in hedge rows to create a living fence, a thick, thorny barrier that kept livestock in and unwanted varmints out. Barbed wire, invented in the 1870s, would eventually replace the Osage hedge rows, but the trees are used even today as fence posts. A stand of them is said to make a fine wind break. My trusty field guide to New York City Trees asserts that the “state champion” Osage Orange is growing in someone’s yard out on Staten Island. (That would be 342 Seguine Avenue, if you care to visit.) I don’t know what it means to be a state champion tree. What qualifies a tree as a champion? Is it size or conformation or age or health or connections in high places or … what? Well, whatever it is, my obsessive research has to stop some time (sadly, I do have other things to attend to), and there are, after all, things in the world that I really don’t need to know. I’m pretty sure the meaning of being a tree champion falls into that category. So, enough. We will now draw a veil around the New York state champion Osage Orange tree, and move on with our lives.